The free responsive HTML5 Bootstrap template is an excellent way to make stunning websites without coding knowledge and without spending a penny. Free HTML5 website templates are becoming more and more popular these days because of the fast loading nature, no hassle of frequent updates, fewer security issues, lightweight and effortless customization which takes very little programming knowledge. Also, it won’t cost you a dime as they are free, it won’t take much time to launch a website as the layouts, scheme and content strategy are pre-designed. All you need is to find the right template matching your requirements or your client’s requirements. 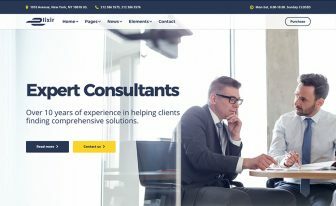 In this post, you will find your desired template for a corporate website, agency, a consultancy business, personal, portfolio, resume, cv, restaurant, lawyer, photography, blog, wedding, and many other kinds of website. 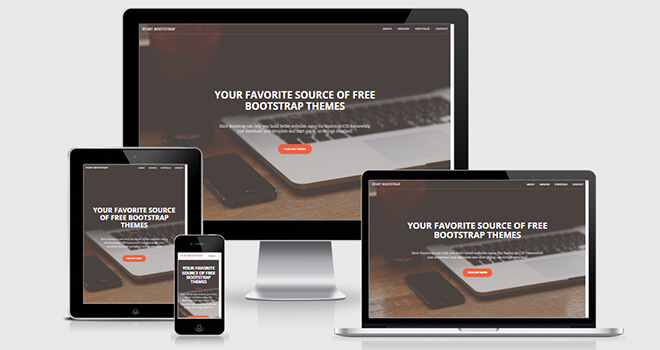 There are lots of free responsive HTML5 Bootstrap template on the internet. Many of them aren’t good as well. The questions emerged eventually where to find the good quality free responsive HTML5 Bootstrap template. There are many blog posts, forum discussion and questions on Quora about the topics how to find the high-quality free responsive HTML5 Bootstrap template. 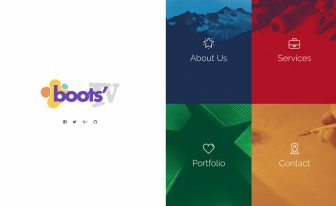 Good news is, this post will help you find the good quality, well-designed free responsive HTML5 Bootstrap template for your personal, professional and commercial websites. I have personally listed this template based on my taste and experience. I have seven years of experience in HTML5 and Bootstrap template design and development. You can count on me. Have you ever tried a fee website template? If you haven’t already because you weren’t sure about the quality then here’s Boxus. 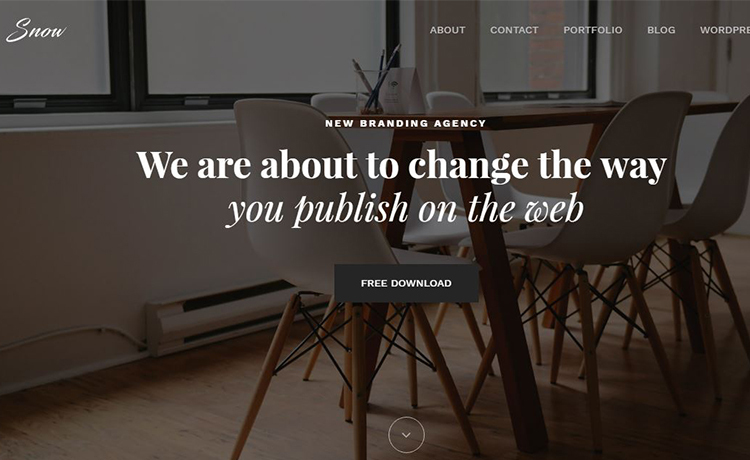 A creative, vivid, captivating, and feature-rich agency template. The niche variations are limitless as one can create websites in category. At first, you have to choose between two portfolio styles. For contact form, there’s a PHP file available. Furthermore, the boxed-style layout and bright color scheme are the reasons to choose this template over others. 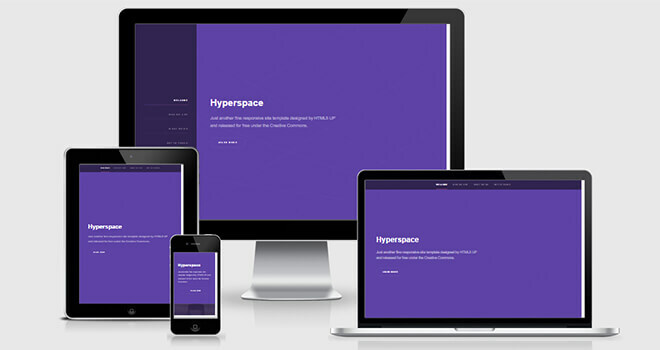 Hyperspace is a free responsive HTML5 Bootstrap template for a small agency, startup, business and other types web site where cleanliness and colors matter. It’s a powerful template to grab the first impression of the visitors. There are a lot of pre-designed elements in this free responsive HTML5 Bootstrap template which will give the designers and coders a great relief. You can choose from hundreds of different text, heading, blockquote, preformatted text, lists, alternate, actions, buttons, table, form, image, left and right image and more. Technology Used: HTML5, jQuery, CSS3, Font Awesome, Skell.js, Util.js, SASS. 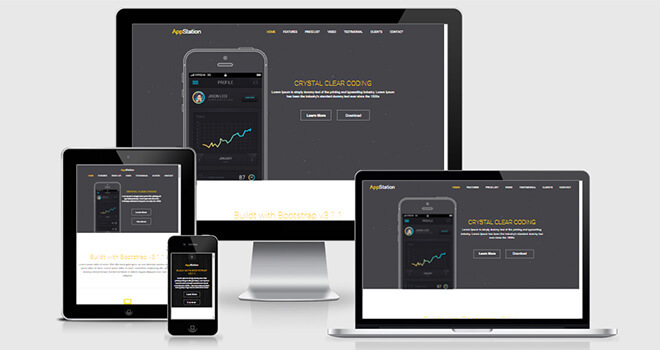 StartOn is a Free Responsive HTML5 Bootstrap Template. 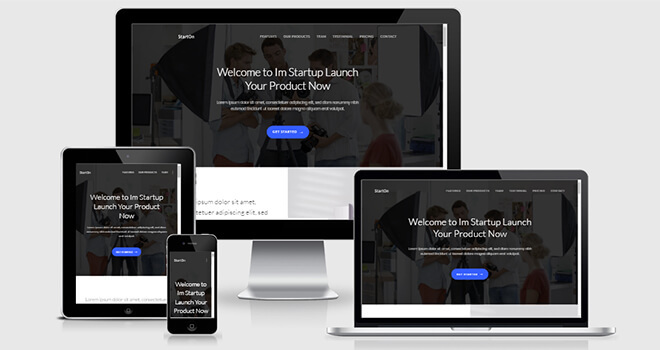 You can launch your startup agency website, portfolio website, service website or startup landing website with this Free Responsive HTML5 Bootstrap Template. It’s perfectly responsive and has an elegant style regarding layout and typography. The template has online documentation. It has also working contact form. Among other free website templates, this is one of the best free HTML5 website templates. Technology Used: HTML5, jQuery, CSS3, Font Awesome, Skell.js, Util.js, LESS. 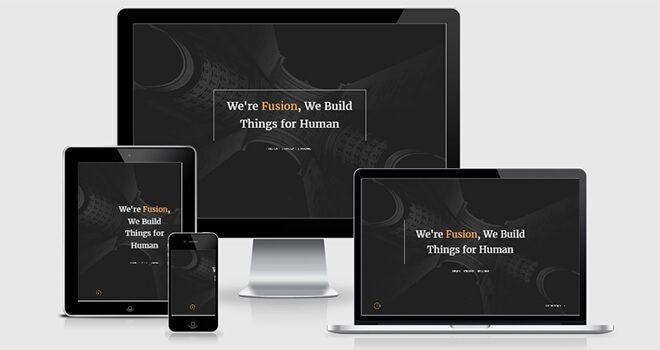 Fusion is a great template crafted with Bootstrap 3, HTML5, CSS3 and jQuery Plugins. This is one of the best templates regarding layout, interaction, and design quality. It’s not only the modern designed but also has something new from future. Many people propose this kind of templates which costs them thousands of dollars. You will find few similar templates in Awwwards. Each section and elements maintain the hierarchy. You will be focused on the specific you want to see. This kind of interaction is going to be the upcoming design trend. And Fusion is the first free template which has this much interaction, world class UX, and elegant design. This is a perfect example of eye-catchy design. 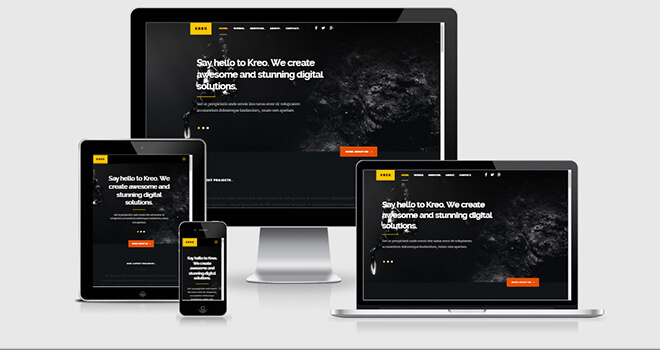 Kreo is a well designed Free Responsive HTML5 Bootstrap Template. It has a dark color scheme, bold typography, and heavy outlook. The template is responsive due to Bootstrap grid system. It’s well suited for the agency website, startup website, personal service website and many other kinds of some websites you can imagine. Technology Used: HTML5, jQuery, CSS3, PHP. 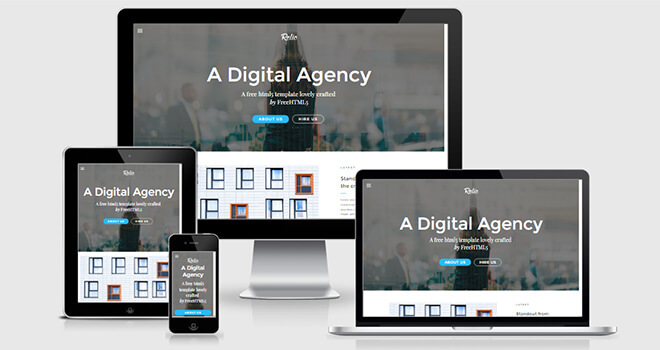 Blu Agency is a free responsive HTML5 Bootstrap template with an enticing blue color scheme. It provides a complete solution for website building with drawer menu, sticky navigation, and social media icons. Moreover, it’s well suited for startup, agency, personal website and similar niches. Let’s create your web presence with the multi-page layout of Blu Agency. Every single page is beautifully optimized and ready to deploy. 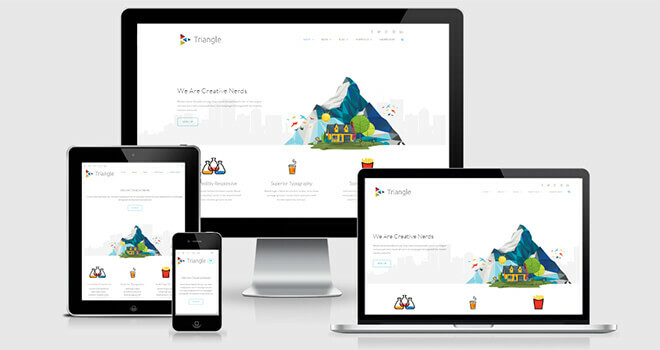 Triangle is beautiful, functional and most loved template in 2017. It has many important pages, elements, sections, the cutting edge layout. Home page with about, services, contact, portfolio, blog, 404, coming soon page and many other pages are here for focusing your information. This is a premium quality free responsive Bootstrap template designed with very high standard and released as free for the community. Take a look at the live demo, and you will understand about the template. Technology Used: HTML5, jQuery, CSS3, Font Awesome, WOW js. Office is a newly designed template to apply for your next agency or business project. The TechNext Team tried their best to amass the largest numbers of the free HTML Bootstrap template to make the readers satisfied. The elegant design, subtle color template, and eye-pleasing typography make the site more appealing. This template is truly a recommended Free Responsive HTML5 Bootstrap Template to download and reuse as more as you want. Once you get the product in your bucket, you can understand, any exaggerating words aren’t said. Strong confidently saying, “Office” is one of best template available out there at free of cost. Technology Used: HTML5, jQuery, CSS3, Bootstrap3, Google Fonts. Nevada Plus isn’t just another template to mark as ordinary because it’s free. The TechNext Team truly put their best effort to make the template market best. When you’re searching heart and soul to find an appropriate template for your company, Nevada Plus is one of the best possible options delightfully. You will love the well-structured design, beautiful color scheme, solid typography, ideally placed grids as well as of this template. 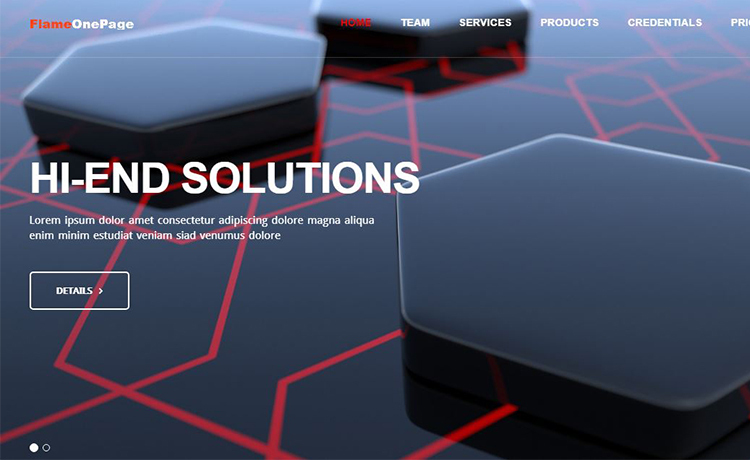 Solid is a multi-page Free Responsive HTML5 Bootstrap Template. It’s best for any agency or business project. When you’re looking for a free template that can meet the whole need, this template is a perfect choice. Before reviewing the quality of a website we never enlist them in our site. So, we assure you about the best standard in the template we recommend for you. With warm color tone, nice typography, well-organized layouts, and the well-oriented design make the site top in order. Technology Used: HTML5, jQuery, CSS3, Bootstrap3, Google Fonts, Font Awesome. Relic is another excellent Bootstrap template that’s completely free to use. From thousands of free templates, we have gathered some best for our visitors. Amid the extensive list, this is one of the best. To acquire better outcome from your job, you should download the free template and use it with your contents. Because you need a free yet powerful template and there are few possible options regarding top-class quality, you should make a choice from here. It’s not like we’re manipulating, it’s just our best compliments. MonkeyDigital is the next right template you need to apply in your very best project. Although it’s a free site yet, you have to get it for several reasons. Fantastic design, well-documented code, subtle color, solid typography, sleek design, mobile responsiveness and lastly no-cost make the site an ultimate choice. 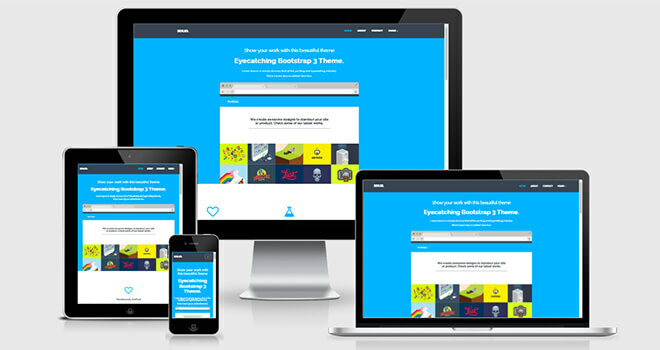 Titan is the Best Free HTML5 Template in the Web. It is a multipurpose template that can be used for the website of any category. It is equipped with all the latest and required technologies available. It comes with both single page and multi page feature and has more than 100 layouts. It can be used for an agency, portfolio, e-shop, restaurant, finance, landing page, photography and much more categorized site pages. 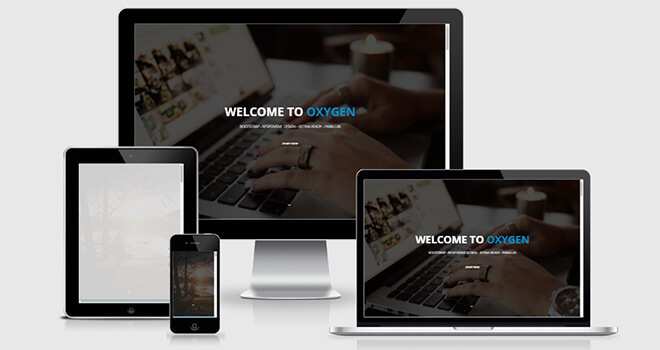 It is a mobile friendly and perfectly responsive Free Responsive HTML5 Bootstrap Template. It also includes the latest trend of video background header option along with parallax background, sticky header background, sliding image background and much more. Surely you can’t find even a premium web template that can be compared with Titan. And Titan is free totally. Flame one page is a latest Free Responsive HTML5 Bootstrap Template on the market. It comes with a single page layout with sliding image header and sticky navigation bar. It is perfect for startup agencies or consultancy firms. It has Accordion integrated collapse bar. This free template is fully responsive and mobile friendly. It can be used for startup and consulting firm regardless of types. Snow is a wonderful creation which might impress visitors in their 1st visit. Its interface is fabulous and polished. The beautiful options of its provide answer every subconscious query of potential customers and boost conversion exponentially. The CSS3 animation could be a unique tool to supply users a pleasant internet experience ever. It makes web contents interactive compulsive.The clean and clear typography helps you to stay around visitors attention through your convincing contents and alternative supporting materials. 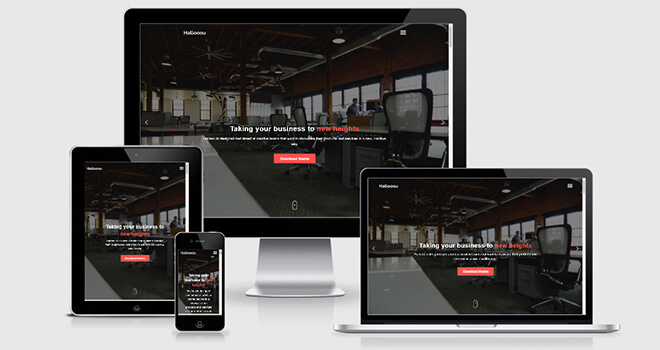 You can use this Free Responsive HTML5 Bootstrap Template for your site. Megakit is a one page multipurpose responsive template. It’s a perfect adaptable template, so you don’t need any core modification. It has the stunning and intuitive design. Besides, it assures you an excellent UX with a great UI. It has the parallax effect which provides a smart look. Megakit is designed using a Bootstrap grid system. It was scaled from smaller to larger devices step by step. 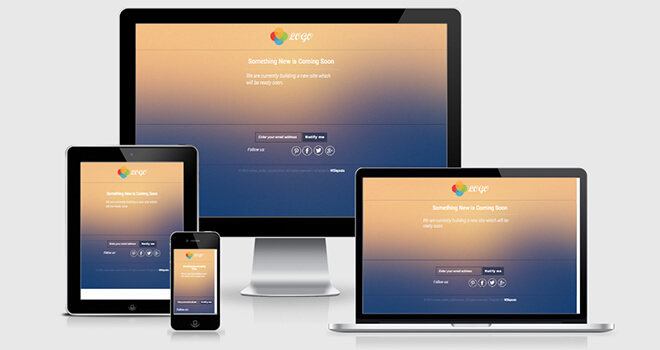 So, Megakit is fully responsive Free Responsive HTML5 Bootstrap Template. 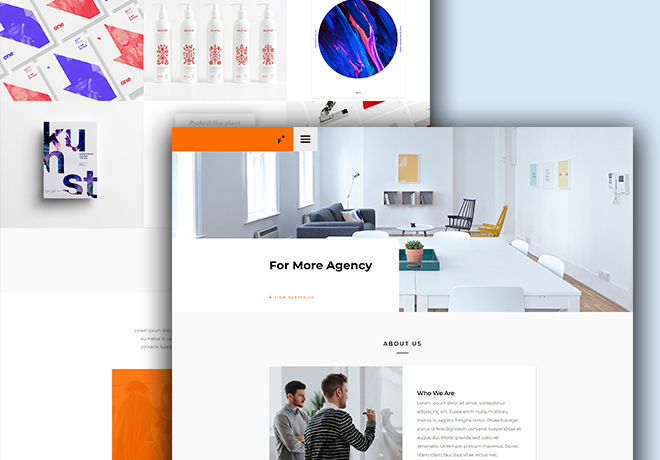 Karmo is an extremely impressive free creative responsive html5 website template which is helpful to build creative startup agency website. This is not only a free creative, responsive HTML5 website template but also the most beautiful free website template. The Karmo consists of four different pages, well-documented codebase and a cluster of latest web technologies. It’s clean, lightweight, professional and trendy design makes it ideal for digital agencies and any kind creative websites. The code base is containing W3C valid markups. All the markup elements are placed maintaining the hierarchy which is helpful both for the users and SEO. 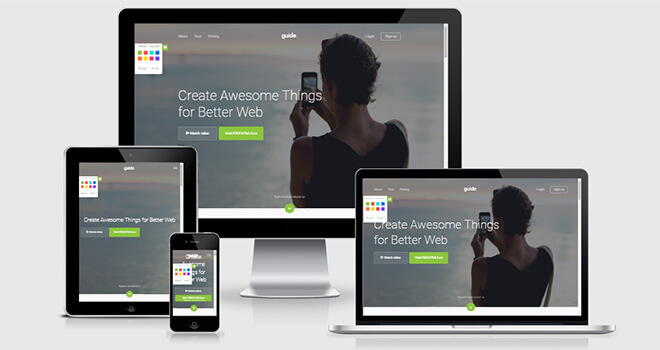 So, it is a perfect Free Responsive HTML5 Bootstrap Template for building websites. Treviso is another Free Responsive HTML5 Bootstrap Template for any startup agency or consulting firm. It has a soft page navigation fashion which makes it different from others. The portfolio, about, contact sections are arranged in a fashionable way which catches attention. Treviso assures excellent UX. It is a simple but smart looking template in the market. 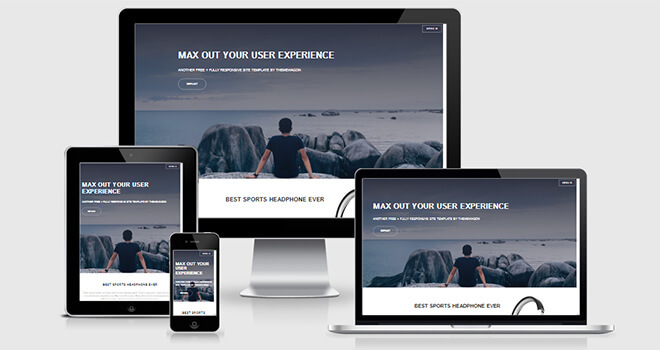 This template is 100% Mobile Friendly and Responsive to all devices and browsers. 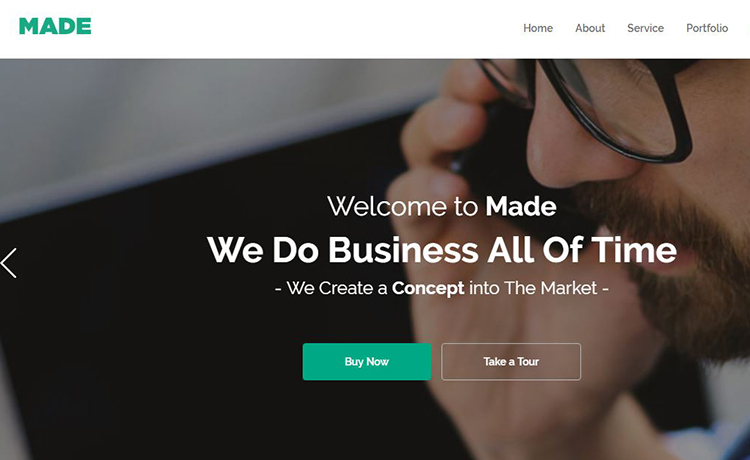 Made One – is such a Free Responsive HTML5 Bootstrap Template that provides the creativity and professionalism to a website. It especially is crafted for startup agency websites. It’s built with Bootstrap grid system, and that’s why it is responsive. Beautiful descriptive owl-carousel slider in the home section will focus your agencies’ brief description at a glance. Also, you can describe your organizations’ details in about section. It is a perfect solution for making any agency site. 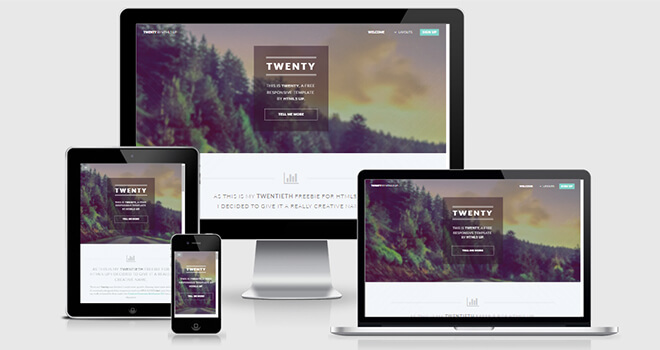 Made two is another Free Responsive HTML5 Bootstrap Template just like Made one. Made Two contains bootstrap. Frameworks like Bootstrap provide some necessary components. Plus, this template comes with lots of traditional UI plugins with a unified color scheme. It is a one page agency site solution with sticky navigation bar scrolling. It is very easy to customize and execute. Fully Responsive for all Device. Commented, Indented and Clean Code. 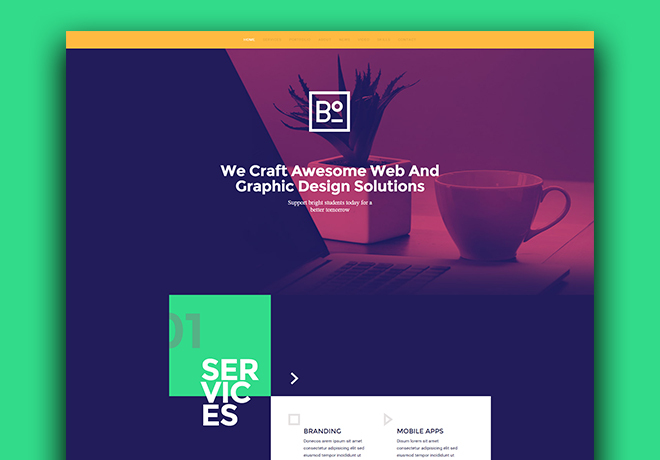 Bino is a free Free Responsive HTML5 Bootstrap Template. 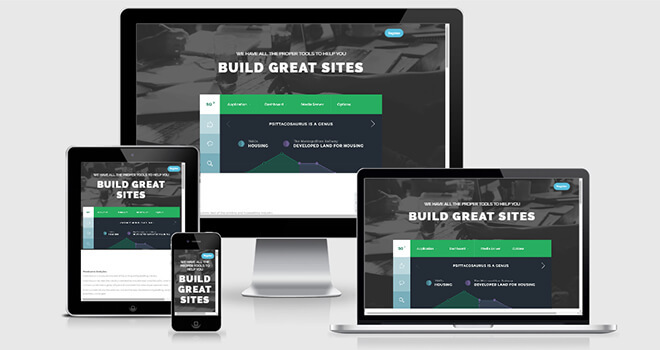 It’s a high-quality template to design your outstanding website without spending a penny. It’s blended nicely with the modern design and the creative layout. It has almost all the generic sections you needed with some creative sections as well. It is cross browser compatible, so it fits perfectly on any browsers. 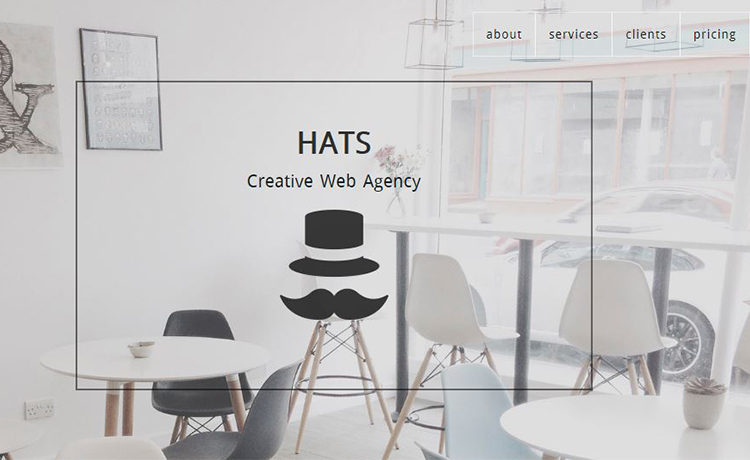 ‘Hats’ is a clean and handsome template, designed with HTML5 and Bootstrap. 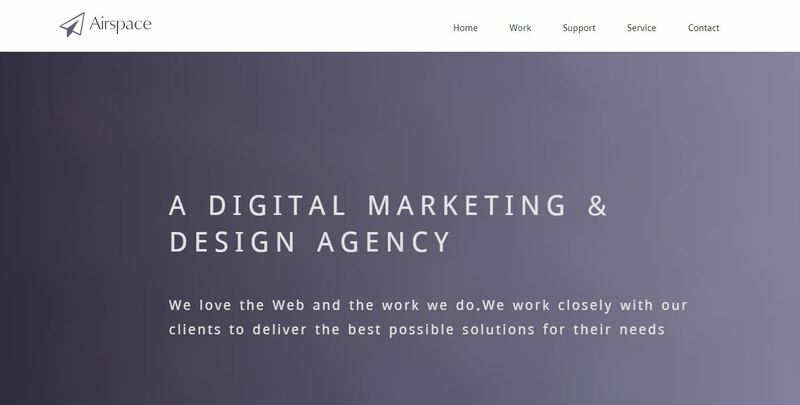 It’s nicely crafted for the creative web agency website and to be used by the designers and developers. It is a clean and handsome template with a unique layout and good typography. It is a good Free Responsive HTML5 Bootstrap Template you can choose. Vira is a new design; it’s so new that it looks like an old wine in a new bottle. 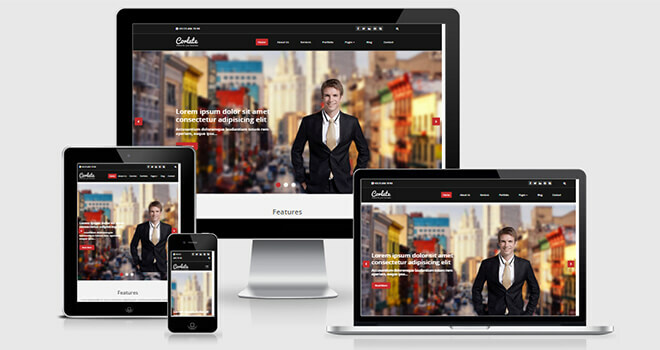 It is a Free Responsive HTML5 Bootstrap Template and suitable for office, agency, business related websites. It’s well crafted with the powerful CSS framework Twitter Bootstrap. It makes the template correctly mobile-friendly and responsive. 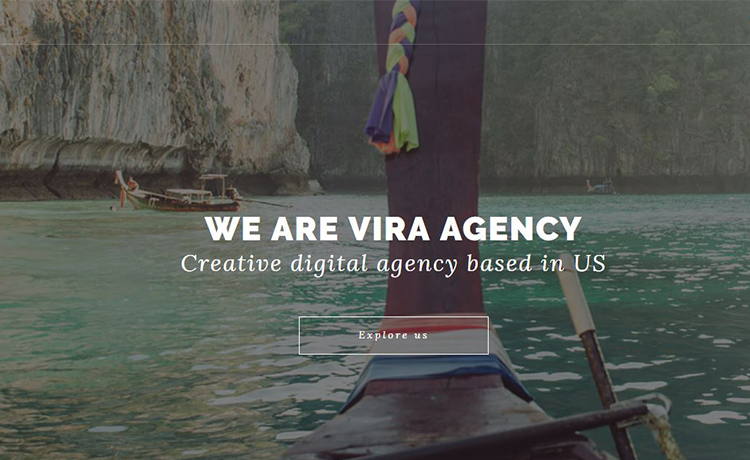 With important sections, Vira is a perfect theme for a start-up company. It is one of the cool free HTML5 Bootstrap templates available on the internet. 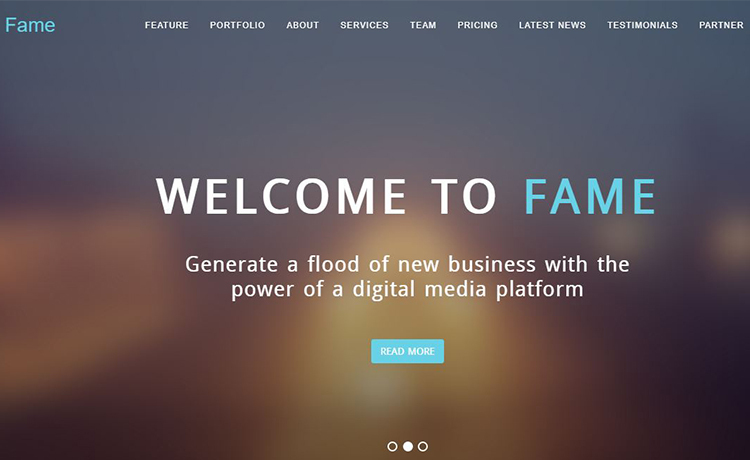 Fame is a good quality Free Responsive HTML5 Bootstrap Template cooked with the most used framework Bootstrap and is the perfect solution for site pages for office, agency or consulting firms. It contains all the demanding elements that you need nowadays! It can be used for multipurpose activities. The template has lots of features and important sections. The most important thing is, this template is fully animated which is eye-catching. It is lightweight and is designed to load in any situation like high or low traffic! If you are looking for uniqueness than Fame is the right choice for you! 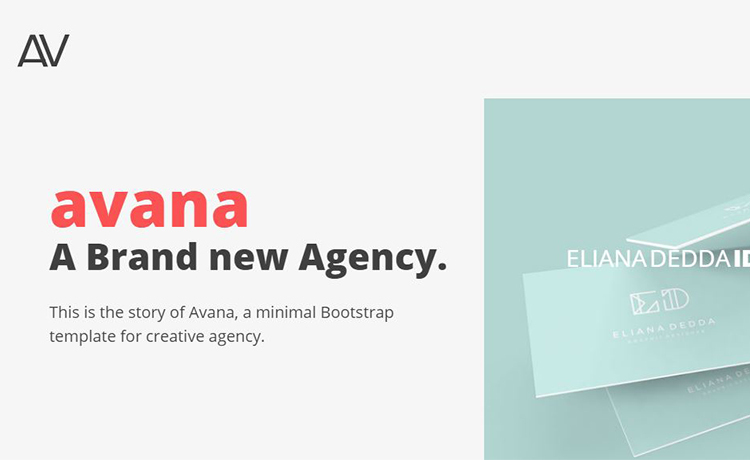 Avana is a one page Free Responsive HTML5 Bootstrap Template. It has a unique design with a cool way to present everything. It is not a conventional template we usually see. Properly maintained HTML codes and links make this template SEO friendly. It is a mobile-friendly and responsive to all devices and browsers. 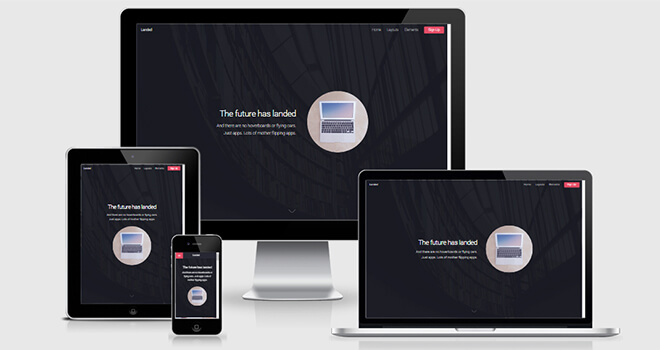 Airspace is a modern Free Responsive HTML5 Bootstrap Template with parallax effect. It is with one page layout that covers all the needed section in a good agency template. 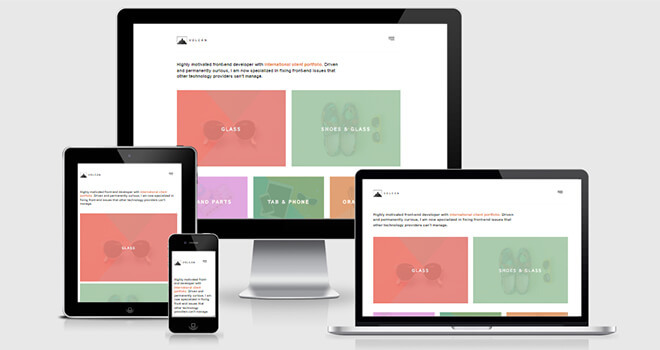 Airspace is equipped with the Bootstrap framework that lets it be responsive. It is a good template for startup and consulting agencies. If you’d like to build an online portfolio that surely catches user’s attention then Profile is the right button to click. 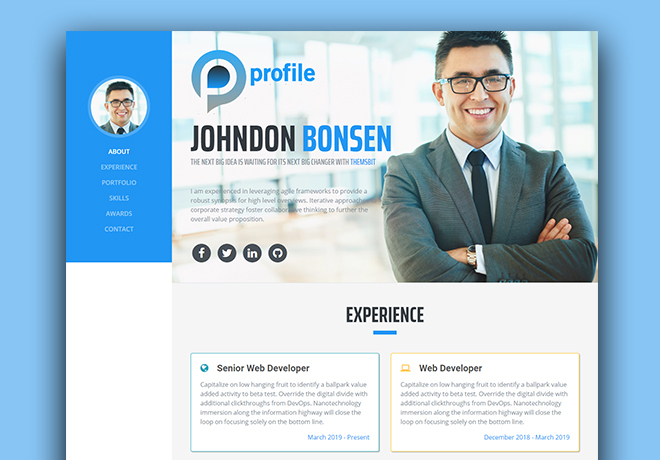 Developed with the latest Bootstrap 4, this template is one of the best templates for creating CV, resume, portfolio, and a personal website. Regardless of the career, Profile ensures to build the site that covers any profession. It’s possible because of its resourceful structure and adjustable layout. A truly scalable sophisticated free HTML5 template for making a personal website. Alexis is consists of a lot of things that you should consider it as a great contribution to the web development world. It has Header, About, Services, Portfolio, Team, Process, Pricing, Testimonial, Blog, Contact, and Footer section. All are carefully designed with pixel perfection. This template is one of the best free HTML5 website templates in 2017. The template is perfect for a personal portfolio template website. You can use it for your small agency or business website as well. There is a vast area you can use this awesome free template. We should call it a multipurpose template rather than a portfolio website template. Stylish Portfolio is a free HTML Bootstrap template for making awesome portfolio website. The clean visual effects and smooth navigation make the template more valuable to get in your collection. One page site is best for portfolio purpose as there could be fewer burdens and more room to breathe. To find out better opportunities, you need a better portfolio to present your works done previously. Just showcase your best work using this latest template. It’s free to download, use, and modify as you want to place it for your purpose. Technology Used: HTML5, jQuery, CSS3, Font Awesome. Developer is an awesome Free HTML Bootstrap template for anyone who seeks to create a great portfolio. Among all the template we reviewed this is truly a remarkable one. Designer’s impressive common sense largely portrayed all over the template. As the architect of the site built it solely for the designers and developers, it thoroughly serves the purpose. To standalone on the online market go forth with this majestic template although it’s a free item. When you get a thing free of cost yet it fulfills your demand as per your necessity then why should you wait? 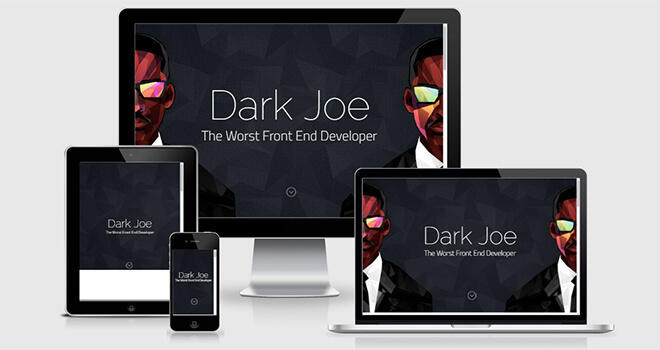 Dark Joe is an outstanding Free HTML Bootstrap template that has so many striking features. Starting from valid markup to SEO-friendly design the site is a magnificent one to pick to get your project done. You can take this template as a prototype then create as many sites as you want to because there’s no cost to have it. To make the readers happy, the team spent hours of coding to make this template as world class creation also to keep it free of any cost. Technology Used: HTML5, jQuery, CSS3, Font Awesome, Google Fonts, Bootstrap 3. 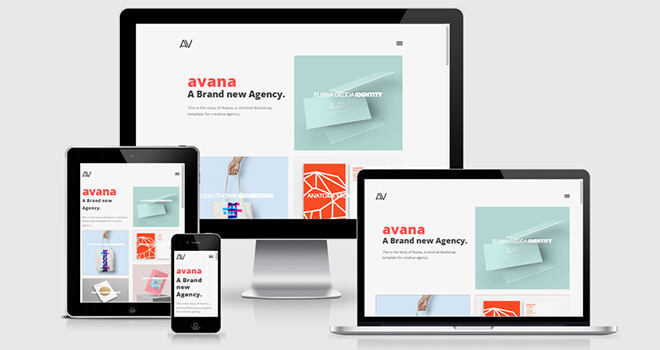 Avana is free HTML template with mobile responsiveness for portfolio. In this era of communication excellence, people tend to present themselves online with their expertise. The best way you can show your work the more chance to grow your career faster. For a better outcome, you need to update your works and skills so that people will find you when they need. This free HTML template will let you show your expertise and your portfolio with an excellent prospect. To download the template, you need to enter your email then you’re ready to go. Volcan is one of our favorite free Bootstrap templates for commercial use. Not only this site can provide you excellent service, but it is entirely capable of giving best utility. From our extensive list of free HTML templates, you can pick this beautiful item. As long as you’re looking for a template that’s pretty working and accurately applicable for one’s dream project then go for it. 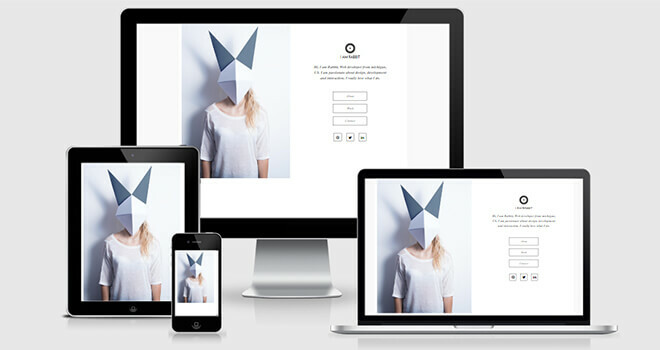 Rabbit is a top quality free HTML template with complete mobile responsiveness. The people who would like to have a template with versatile actions they need to select this template. Once you download it, there are no other extra hazards that could give you dissatisfaction about the site. With your contents modify the site and go live. That’s easy! J. Klimt is an absolutely beautiful template based on HTML and Bootstrap. When you don’t know which template is the right one for you and you’re stuck at a certain point – we recommend downloading this. As you know, it’s quite hard to find a free Bootstrap template that is a real working template. But when we’re here with a huge list to provide you right help you don’t need to worry. BS Resume is also a brilliant HTML template based on Bootstrap. This free and outstanding template will let you do more works in less labor. You have a good option to save both your time and money. Just download the template and use it as per your need. All free HTML and Bootstrap templates are not valuable. But in our long list, we gathered all the best quality items because we have no wish to deceive our readers. Kards is a modern, unique and clean personal vCard website template. It has many cool features. It contains timeline items, stats section, bars, working ajax form, frontend form validation, a portfolio section to showcase your works and much more. Being responsive, it fits perfectly on all devices. It’s also retina ready. Therefore your site will look fashionable and sharp on any screen. A working contact form will help your delegates to communicate with you. Kards is the ideal template for digital personal resume and portfolio website. 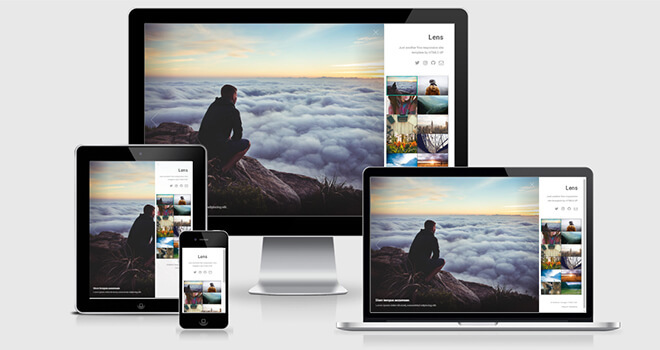 Letrinh is a Personal Portfolio Flat Responsive web design template. It is a free template. This template comes for those users who are creating websites like one-page personal, corporate or non-corporate sites. Letrinh has a Fancy style. The user can easily customize it to their requirements. 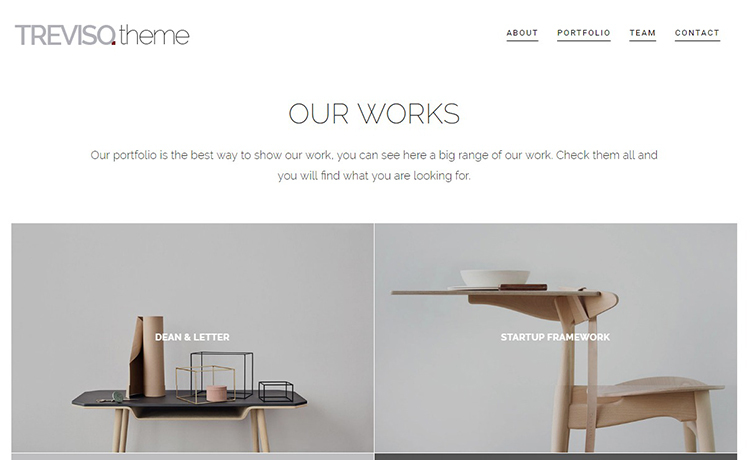 Letrinh has a horizontal layout and new portfolio scheme. It contains a full page header with a smooth toggle button. 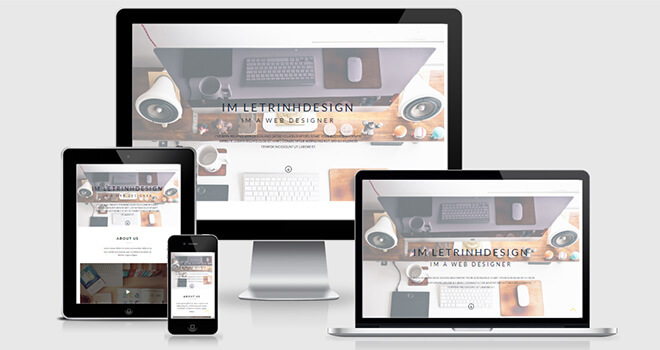 The responsive portfolio template is suitable for multiple devices. Letrinh produced with a good color scheme and good grid style of elements. It can be used to start your Portfolio website. Check the demo for clear understanding. 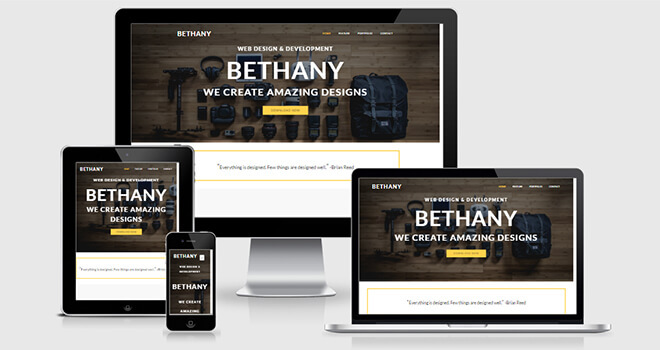 Bethany is a stylish, modern and unique free template for modern web clients. It comes with clean and flat responsive style. It suits to you who like a minimal and modern design. You can use this template for creative agency, portfolio, photography and corporate business. The developers use Bootstrap front-end framework, CSS3, HTML5, and jQuery technology to build this. It is very simple to customize and use in your project according to your desire. Bethany is compatible with all major browsers. It also fit on every device for the bootstrap grid system. It will save your time and gives a trendy look to your next web project. 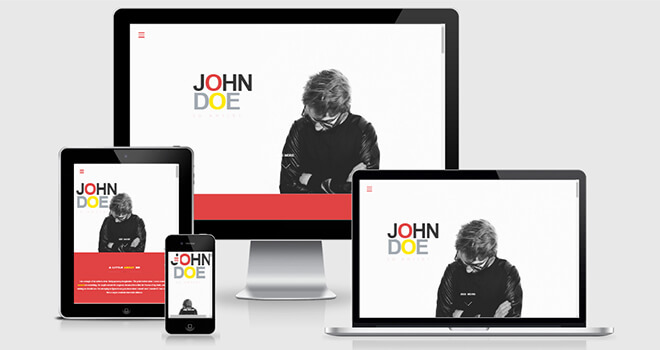 JohnDoe is a free one-page Portfolio website bootstrap template. 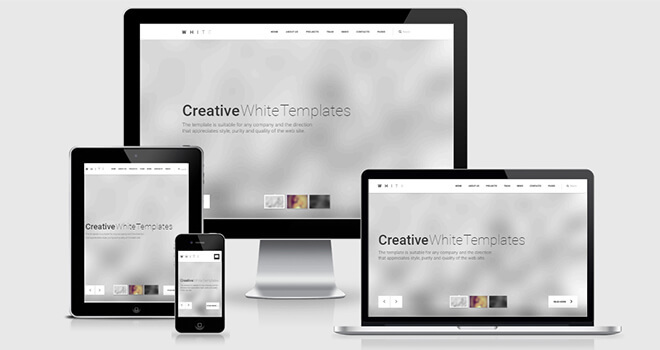 HTML5, Bootstrap 3, and CSS3 are the base to create this template. It’s one of the most downloaded successful personal website templates for portfolio or resume. Some cool CSS3 animations and jQuery effects enhanced the beauty of JohnDoe. It has an innovative menu style which probably does not use anywhere else. The TechNext Limited uses W3C validated codes. Hence, the possibility of fall-down is rare. Every section starts and ends with comments. Therefore, you can find quickly and make the changes within a short time. 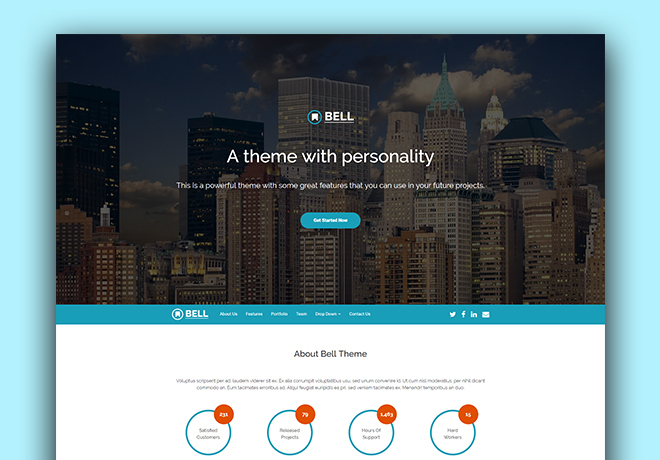 Bell is an extraordinary business template to use in multipurpose niches. Although the layout suits best for agency and business firms, anyone can take it to build a professional site of any kind. Since Bootstrap is the staple strength of Bell, it looks awesome across all the devices. From animated counter, parallax effect, on-hover action, to sticky header and burger menu, it helps users to stay updated with their sites. 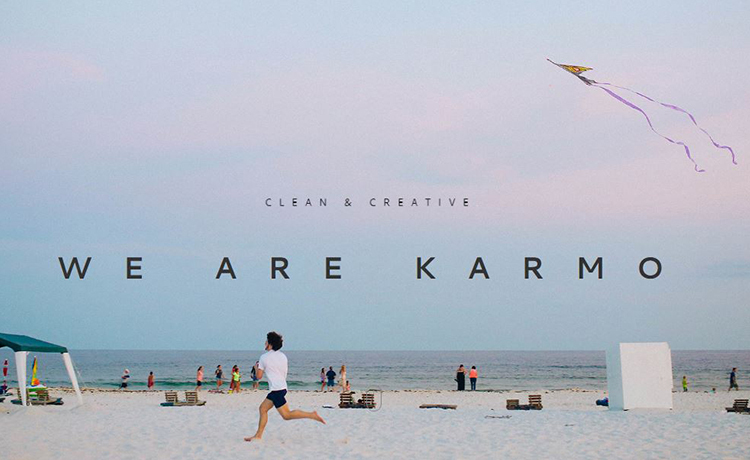 Senda is a clean template designed by Peter Finlan, exclusively for Codrops. It’s a multipurpose template, you can design a wide range of websites with this free HTML5 template. 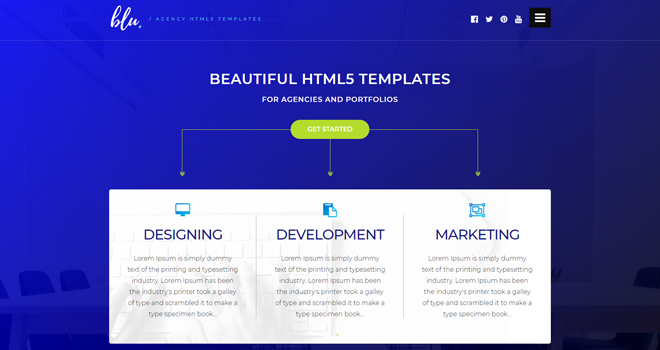 You can design a landing page, a portfolio website, an agency website with this template. The design is clean, smooth animation and good typography. Download it free. The template is designed with Bootstrap and HTML5. Slab is a multi purpose template. It has a lot of section which you can turn into any websites based on your requirements. The good thing is all the elements have a cutting-edge design with modern and trendy design concept. The best thing is this is free. 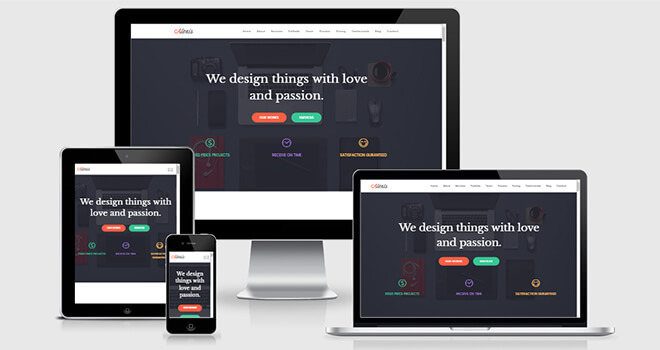 It’s a free multipurpose website template designed with Bootstrap 3 and HTML5. The template has very elegant design with the important section and element you need. This is one of the best templates in 2017. 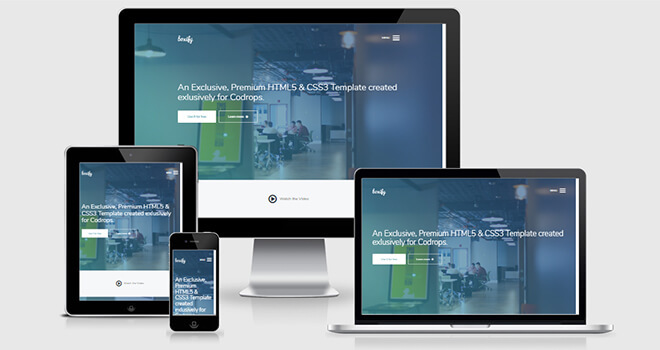 Boxify is a free HTML5 template designed with Bootstrap framework. It’s a mobile-friendly template designed by Peter Finlan, exclusively for Codrops. The template can be used as few types of website templates. The design is clean, the layout is responsive, the animations are smooth. 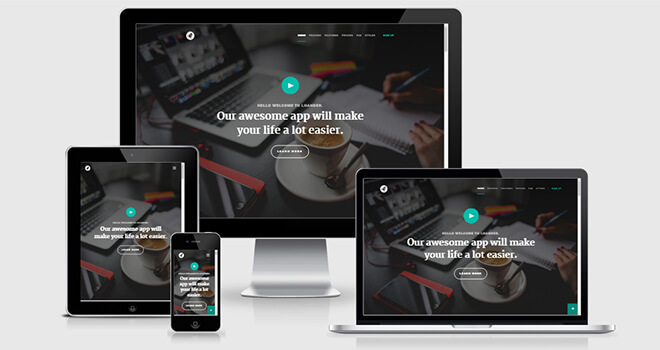 Hallooou is a free and responsive HTML5 multipurpose template. The design architecture is so simple and beautiful that you can use it for any purpose. 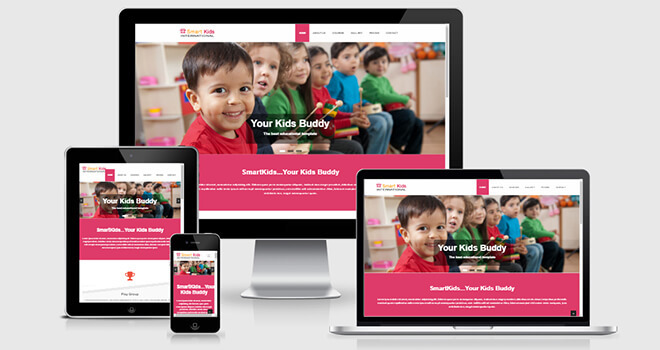 This template is responsive which means you can view this site very well on any device. For business, startup, agency, portfolio or even for personal use, this free template is a great site to download. The parallax background, crisp animation, video section, service page, and contact option makes the site to grab for best purpose. Under Common Attribute license one can use it free for lifetime. 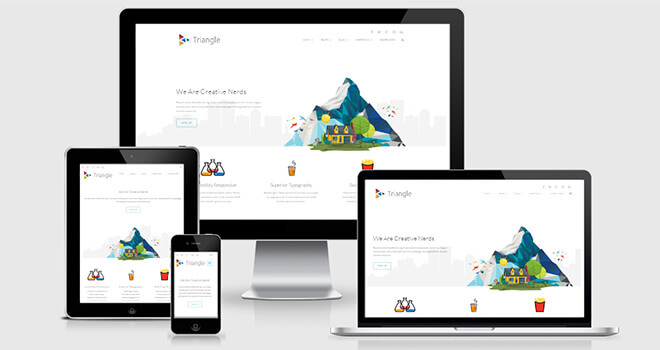 Triangle is a modern free HTML5 template made for multipurpose use. Any individual or company who wants to show their best work in creative style this web template is the right choice. Because of the super attractive animations and subtle color scheme, this template looks more appealing. As a creative and free HTML template, this site is worth downloading it for your wish of making a great website. You can also check the demo before downloading it. 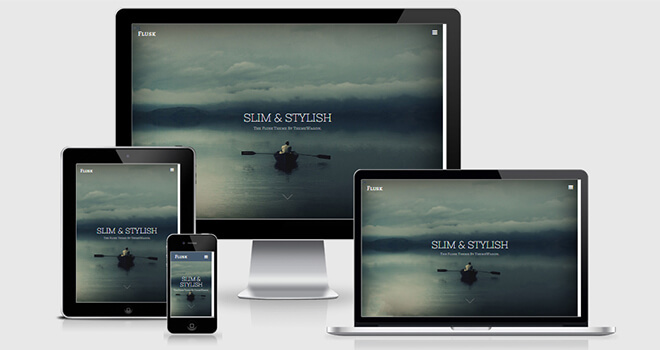 Flusk is a wonderful template even we love it to share this with you. Having hundreds of Free HTML Responsive Template why should you go for it? This template followed burgeoning trends the developers of the world following right now. We recommend this template because it’s well-structured and well-designed layout. You can’t find a template with this quality at completely free of cost. Technology Used: HTML5, jQuery, CSS3, Bootstrap3, Google Font, Font Awesome. 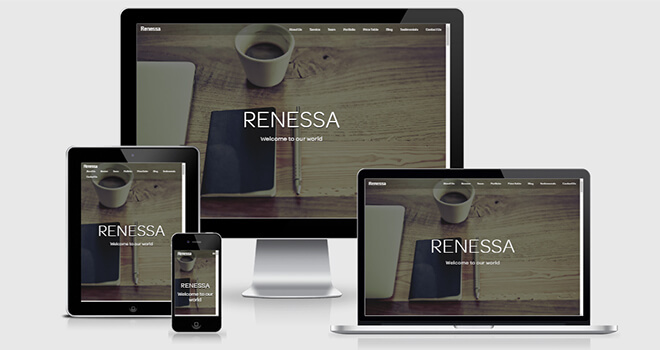 Renessa is a Multipurpose HTML Template created with Bootstrap3. This template is a clean, responsive, beautiful, and exceedingly well-structured to take it for instant use. Without worrying too much, you can just download it and modify as per your demand. As you know, multipurpose template means you can apply it to any project. Whether you have a small company or a large one or even you are just your own all the way there’s a choice that you can use it throughout your essential works. 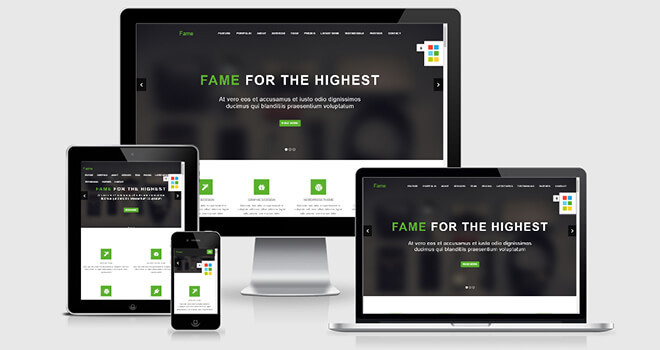 Fame is a nicely designed multipurpose template. By including all the mandatory elements, this template has become one of our favorite picks. You can use this multipurpose template for anything you want to create. From business to personal needs one can utilize this free HTML Bootstrap template for any purpose. Moreover, the versatility of the design makes the template more desirable to gain success. Once you get it, there’s no barrier to reuse it for multiple projects. 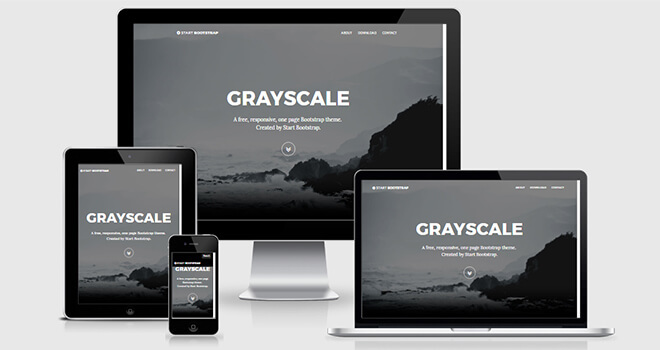 Grayscale is a one page multipurpose website based on Bootstrap3. With smooth navigation and dark layout, this template is an awesome item to select for your business. Unlike many other free items, this template is an exclusive one. You can apply it for any project no matter it’s an agency, institution, service or voluntary organization. The sleek design and mobile responsiveness make the site more worthy. Don’t just skip it because it’s free. The developers included all the essential elements meticulously with considering best user experience. Technology Used: HTML5, jQuery, CSS3, Bootstrap3, Google Fonts, Font Awesome, LESS. Logic is a highly appreciated template after its release. Unlike the other hundreds of free templates, this is a special one for several reasons. From the well-oriented UI to the tiny design detail it has some robust features to choose it for your best project. It’s wise not to waste time searching for a template while you can get a perfect one at a single page. Grab this beautiful free item and stay happy because it lets you do more. 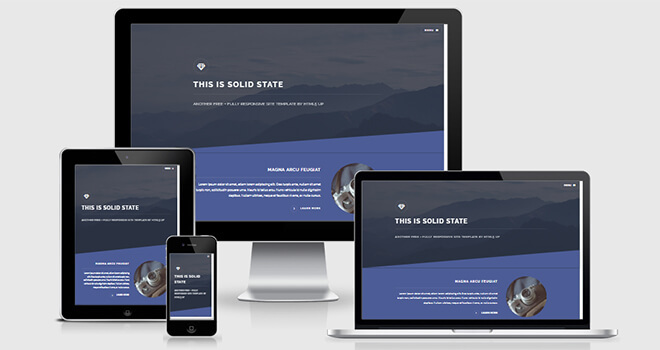 Solid State is a mobile-friendly free HTML template. With this professionally designed template, you can bring your business to a new height. It’s not just a free template with some ordinary elements. Having all the modern, up-to-date technology this site has a premium quality value. Well-documented codes and valid markup will let you customize the template at ease. Corlate allows you to create beautiful sites with less trouble. It’s possible to save your time and money by using this template. If you’re able to work with HTML and CSS then modifying this template is easy and simple. You don’t need to worry about the design and other essential things because the developers covered all these things. Just download it and start enjoying. Lancer lets you do more things with less effort. The developers created the template thinking for the users so that they can apply it with no hassles. Let’s just start making websites by getting the free template. Insert your contents to the right places and enjoy a great website in a quick time. 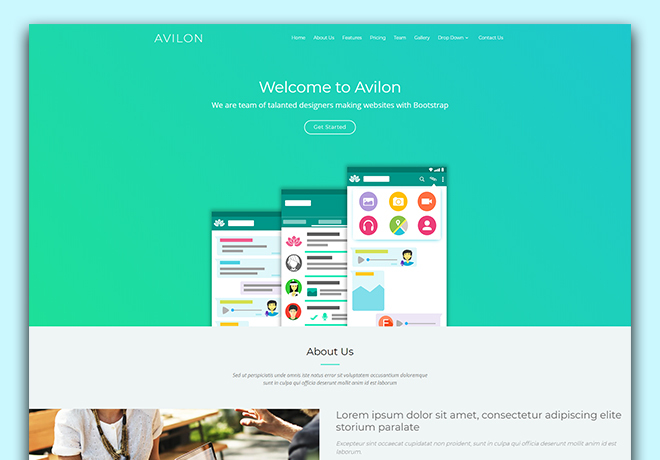 It’s Avilon, the new, tailored, gorgeous, and enchanting template for landing pages. For promotional purpose of apps, software, services, digital products, or other relevant creations, this template suits perfectly. Due to its first-grade features and sublime design Avilon is capable of attracting people’s mind. Now is the time to advertise your products and earn some good sell. Google Fonts, jQuery plugins, Font Awesome, and similar modern technolgies keep you stay ahead of time. Also, it gives you the opportunity to tell about your products and company in a long canvas. 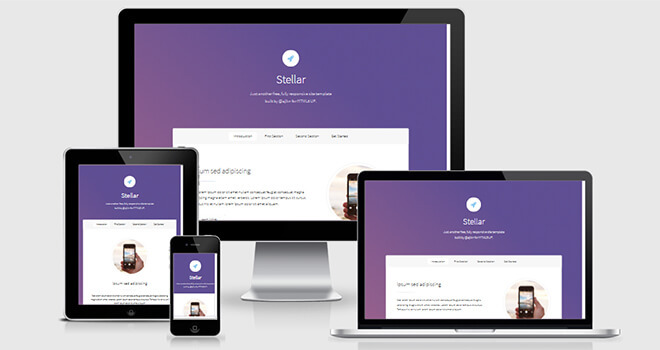 The Stellar is a high quality free HTML5 template for landing pages. Designed with HTML5 and carefully crafted section by section from top to bottom. It has a great color scheme, perfect layout for showcasing the introduction, features, fun facts, generic section and much more. The main feature is sticky navigation. It sticks with the header area while you can browse the other section easily. Everything at your fingertip, this user experience is very good comparing to other free HTML5 website templates. Landed is a landing page template. Designed with HTML5, CSS3, jQuery. The template is best suitable for landing page website. 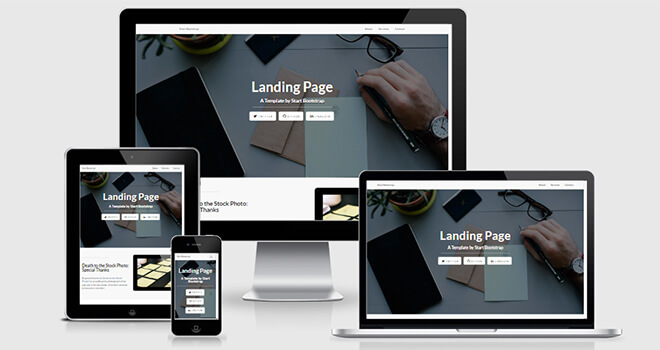 You can make an app landing page, a product landing page, a software landing page, a book landing page or any other kind of templates easily with this free landing page HTML5 template. It has subscription form, necessary elements designed for you. Download this free template for app landing and make a coming soon product website, new arrival of your digital product and more. 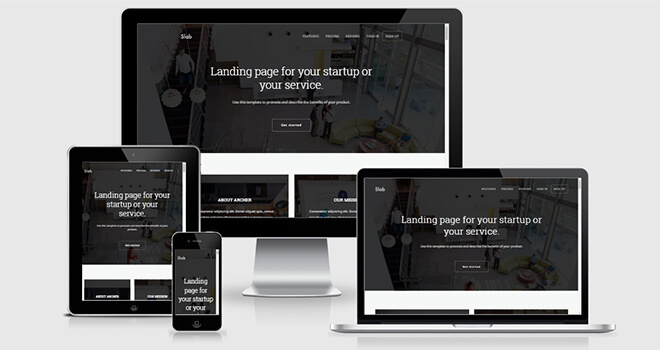 RIK is a responsive app landing page template. Download it free from TemplateOcean. The template is designed by the author of Kane, one of the best premium app landing template in Themeforest. As expected, the design looks clean; the typography is beautiful, the sections have the modern design. There are three types of header styles – Image Background, Solid Background, and Video Background. And Yes, this is a free app landing page template. You can name it as one of the best free HTML5 website templates in 2017. 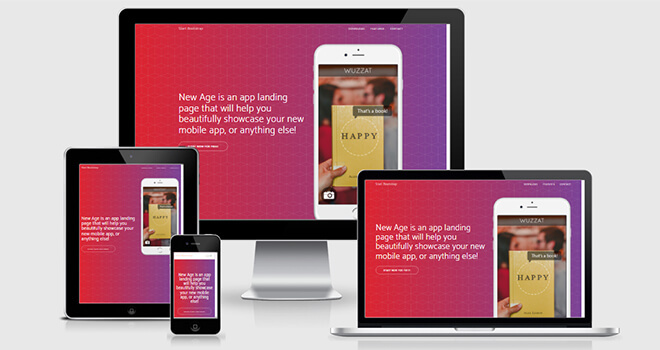 New Age is a responsive app landing page template. It has a big, bold and beautiful design. The typography is bold. The aesthetic is better than any other free HTML5 templates. The template has a download section with two buttons to download the app, games from the app store and google play store. It also has a feature section with creative design. 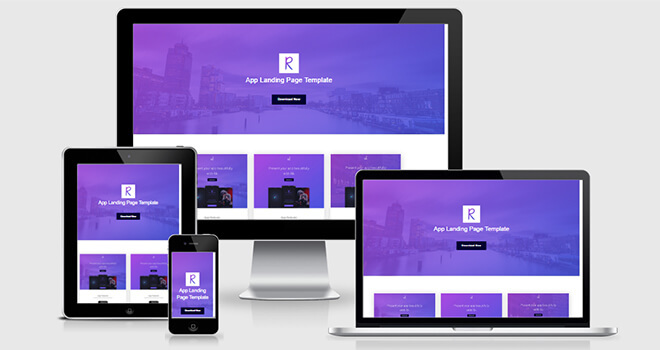 Download this free app landing template and build a beautiful app landing page without coding knowledge. 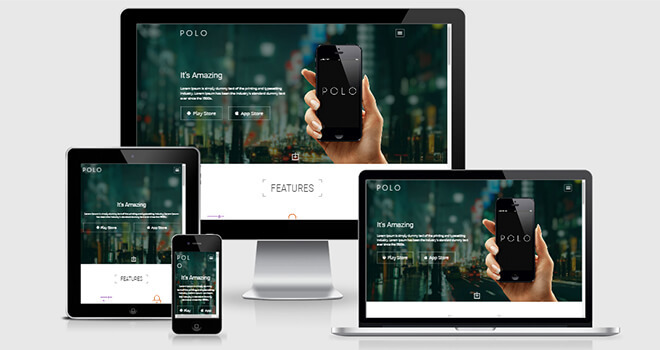 Polo is one of the great templates we have reviewed in our blog. Not many free sites provide this sort of fabulous creation for commercial use. As the site follows burgeoning design trends, it has great functionalities too. This ready-to-use template will save your precious time of coding and think of design. 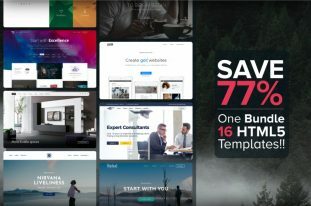 This site has included all the crucial elements of a great template like a fresh design, valid markup, SEO-optimization, mobile-responsiveness and modern techniques. Boxer is a time-saving template that is ready to apply in your projects. As it’s completely free, you can use it without any hesitation. And relax because you don’t need to worry about design or coding; they’re valid and fresh. In response to the love of the admirers, the developer company lets the template to download costing no penny. AppLayers will allow you to take your product to the targeted customers. With excellent visual presentation and rational design help the buyers to choose the product with high satisfaction. As people love simple and practical things without fuzzy promises, the design of the page is more important than anything else. Don’t get stuck to choose the right landing page that better represents features and benefits of your product. Just get this template and start the promotion right away. LifeTracker is a highlighted item in this big Free HTML Bootstrap template list. While you’re looking for a template that can meet your sole purpose we’re compiling this list only for you. Among large numbers of other free landing pages, this template is an exclusive one. The design, color schemes, minimalism, simplicity, and wonderfully organized the sections – altogether there are many reasons to love it. 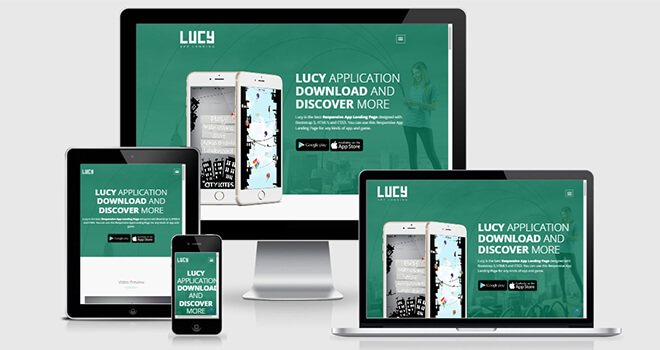 Lucy is such a fabulous landing page that can fulfill your wish with effectiveness. You can leverage the template to tweak your sell at a large extent. No matter what product you’re promoting you need to give it the best place so it can bring you more success. 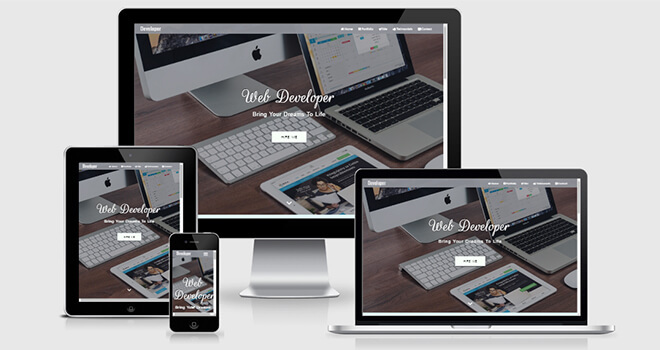 To acquire maximum benefits, the HTML Responsive template like this one plays a massive role. So get the template now and enjoy more profits through user engagement. 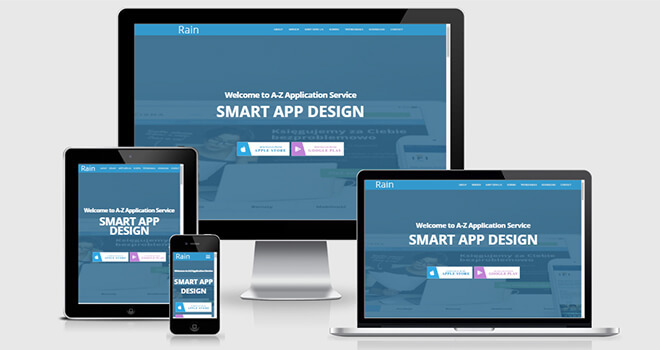 Rain is a mobile-friendly free HTML template. Today the number of people visit websites from mobile is increasing drastically. That’s the reason a site owner should always put importance on mobile-responsiveness. This particular template isn’t just responsive, but it has sharp visual appeal as well. We didn’t choose the sites that dearth of burgeoning trends and required elements. We reviewed and collected the best items for our beloved readers. Landing Page is Responsive HTML template made for product promotion. Creating with Bootstrap3 this one-page template is a great piece to get for your products. Once you download it, you can reuse the template for multiple products release. Modify the template with the new elements that help you saving more time for every new project. This landing page is an appropriate one having capabilities to serve the purpose the exact way you want. Appstation helps you saving your time and money. A well-decorated website like this would help the users making sites that work well with more effectiveness. Don’t just spend your time looking for a good site because here’s the grand list. 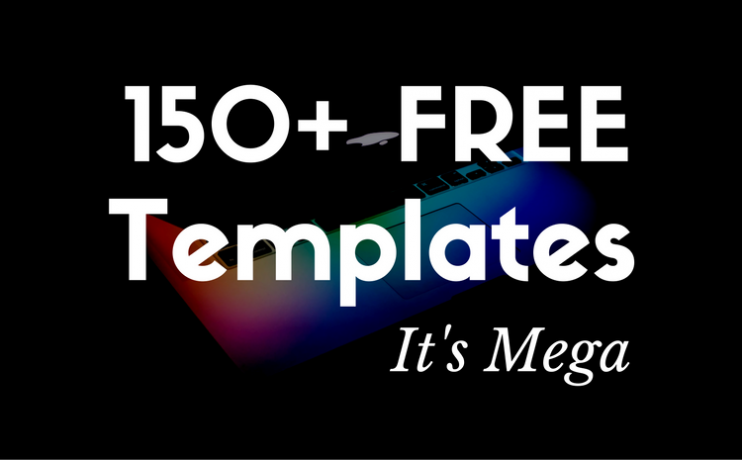 It’s easy to pick the right template from out well-organized free templates bundle. Lhander is also a free template with pretty awesomeness into it. 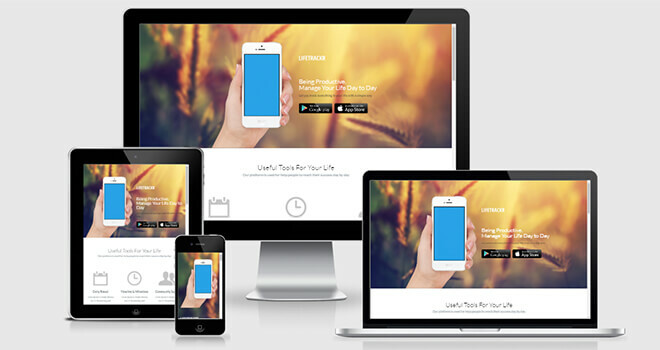 Based on HTML5 and Bootstrap3 this template is entirely mobile responsive and an ideal solution for a landing page. You need a little knowledge of HTML, CSS to customize the template for your project purpose. The elegant design and well-structured layouts will let you do more things in less time and effort. Landing Sumo is an absolutely beautiful template to implement your ideas perfectly. Not this site is just outstanding in visuals, but it has a great effectiveness too. No matter how well are you willing to make your site you can do it by applying this template. From our extensive list of free HTML Bootstrap templates, you can select one as per your need. Traveler is such a brilliant, amazing, and efficacious website template only for the people who want to surpass the mediocrity. In terms of design, ten to one the template is clean and futuristic and marvelous. If you get one step further and download Traveler, you’ll soon understand how comfortable the template is to customize with freedom. The template is the best choice to make travel agency website. People can book a trip through the form. Begin with a hero header Traveler has many enticing options such as lightbox gallery, newsletter subscription, dropdown menu, counter, and what not! 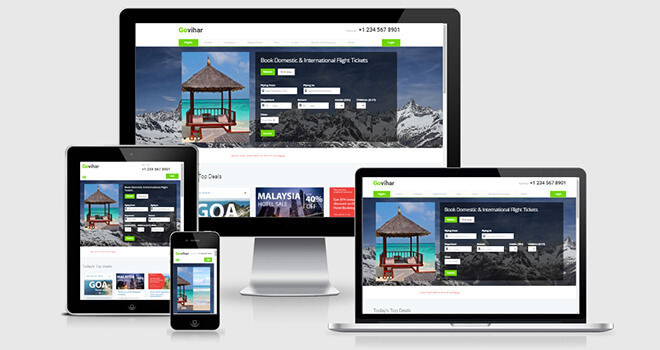 Guide is a free travel agency website template. Designed with HTML5 and Bootstrap framework. It is one of the best Free Responsive HTML5 Bootstrap Template in 2017 for a travel agency, travel planner, or travel guide websites. The best thing about this spectacular travel agency template is that it has eight different color scheme with boxed and full-width version. You can easily switch the color and layout without adding or changing any single line code. About, tour, pricing, login, and signup page present in the top menu bar. Besides this, other important pages are also included in the footer menu bar. Bootstrap frontend framework is laboring behind this template to fit it on each device. You can easily develop a hotel booking, tour booking, a travel guide website with this free HTML5 Bootstrap template. Technology Used: HTML5, CSS3, jQuery, Icomoon, SASS. 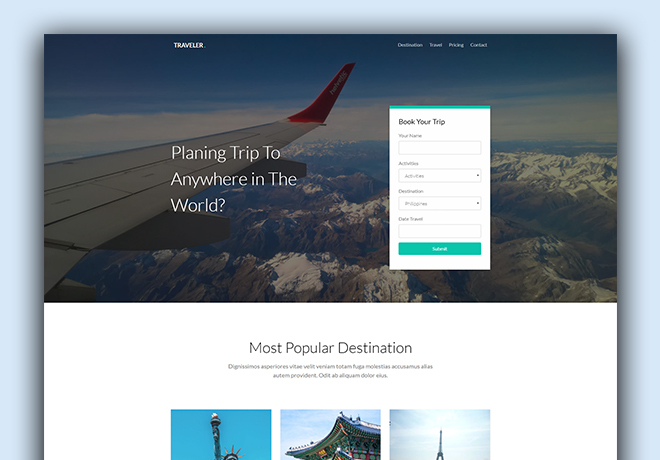 Travel Media a free responsive Bootstrap template ready to use to launch your travel planner or travel guide or travel agency site. It is one of the best premium quality templates that can be got totally free. Seriously the excellent design and beautiful color selection is something new to select the Travel Guide for your business. Among few free websites, that sincerely maintains quality this site tops others. So, without any doubt, this site is suitable for both expert and novice. Technology Used: HTML5, CSS3, jQuery, Modernizr. 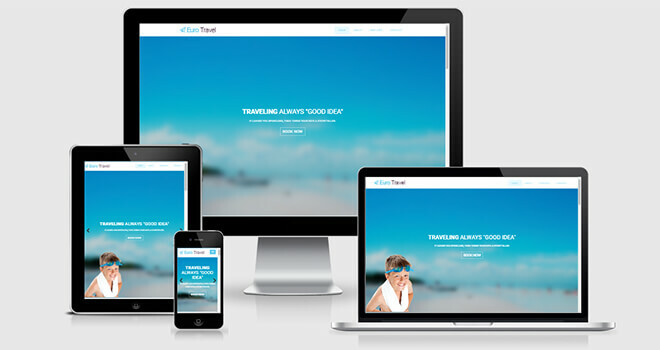 Travel is an attractive Free Responsive HTML5 Bootstrap Template especially for a travel agency, travel planner, travel guide, etc. Made with HTML5, CSS3, and latest jQuery plugins. To pass a vacation gladly, people look out for a destination on the internet before leaving home. The better your site, the more your visitors. The first thing that attracts people’s mind is a beautiful interface. Also the typography, color schemes, elements positioning also have great significance. Fortunately, Travel has all the necessary components stated above. Technology Used: HTML5, jQuery Plugins, CSS3, Font Awesome, Animate css. 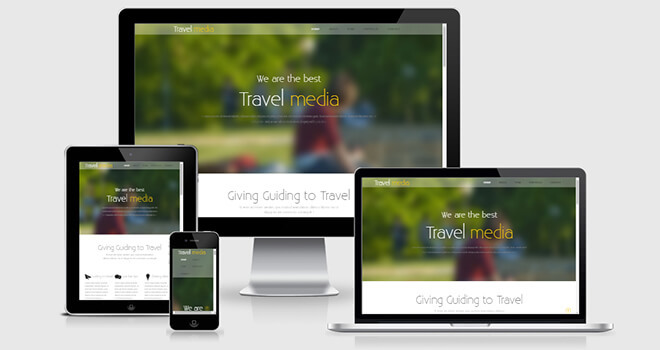 Travelers Free Responsive HTML5 Bootstrap Template isn’t just another free template to review. We’re going to tell about this excellent website because it passed all the indicators with awesomeness. 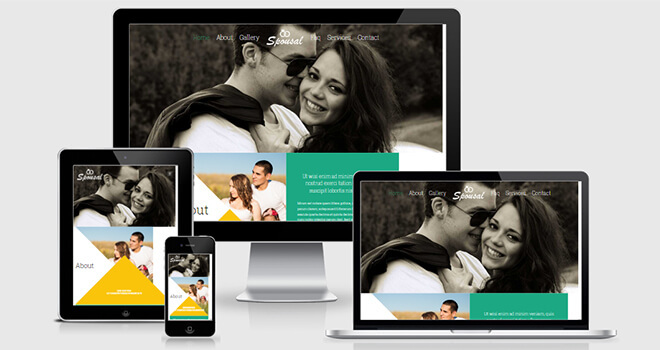 Few of the free HTML responsive template can deliver a splendid performance like this. You don’t need to heed our statements as you’re a click away to download this impressive site. All needful sections are included which make’s a pompous template faultlessly for a travel agency or travel guide or travel planner website. Technology Used: HTML5, jQuery, CSS3, Bootstrap3, Parallax Scrolling, Font Awesome. EuroTravel is an exclusively designed website for travelling business. By modifying the site with your elements and services, you can easily tweak your business to the next level. The nicer your site is, the more profits you’ll get. This sort of premade template is very useful that helps to save both your time and money. To give our visitors special privilege, we picked only the templates that have amazing features. Technology Used: HTML5, jQuery, CSS3, Bootstrap3, Font Awesome, Ionicons, Flexslider, Owl Carousel. 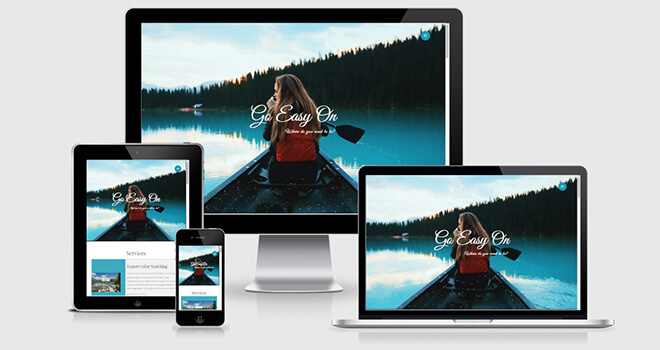 The Go Easy On is a HTML5 free responsive Bootstrap template especially prepared for the vacation trip planner website. The W3Layout Team built this using Bootstrap frontend framework. So, it has 100% responsive layout which fits perfectly on each device and browser. This is a very light template that has suave design concept too. It has well-commented markups, why easy to customize. You can modify this template within a short time without any hassles. Only, make sure use the proper images, change the current text and make it on your own. Technology Used: HTML5, CSS3, Bootstrap 3, jQuery Plugins, Google Fonts, Animate.css, Modernizr. Twenty is a fresh new Free Responsive HTML5 Bootstrap Template comes with the sections that helps to run travel agency website crafted by The HTML5Up Team. It has 100% responsive layout, elegant design concept, very lightweight and easy to customize. It’s a multipage website template for many other purposes like product landing page, portfolio website, travel blog site, corporate website, etc. Technology Used: HTML5, jQuery, CSS3, Google Fonts, Font Awesome, Skel.js. 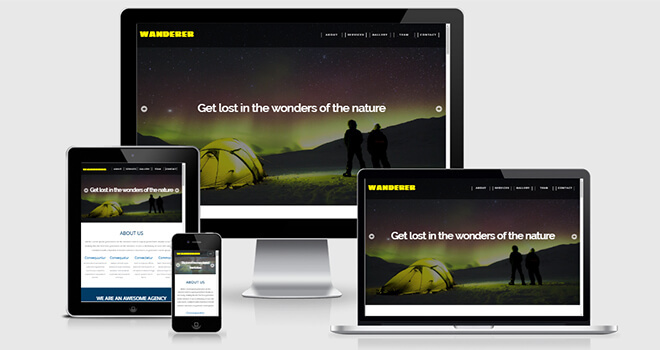 Wanderer is a Free Responsive HTML5 Bootstrap Template that help to run travel agency website. The W3Layout Team used Bootstrap framework to the layout responsive. It has well-commented markups, SEO friendly W3C valid codebase, major section relevant for a travel agency website. Wanderer is too much easy to modify within a short time. 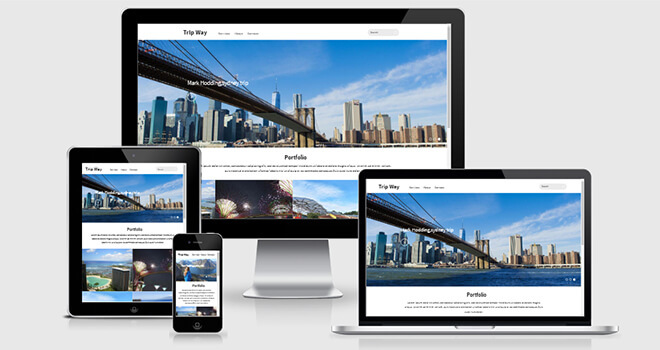 Trip Way is a Free Responsive HTML5 Bootstrap Template developed by The W3Layouts team. It comes with an elegant design concept. This template fits on every device for the Bootstrap grid system. Sections included in The Trip Way will help you to built a travel agency website without any hassles. You can easily play with this for its good documentation. Please, check the demo template carefully to verify it. Technology Used: HTML5, CSS3, Bootstrap3, jQuery, Google Fonts. 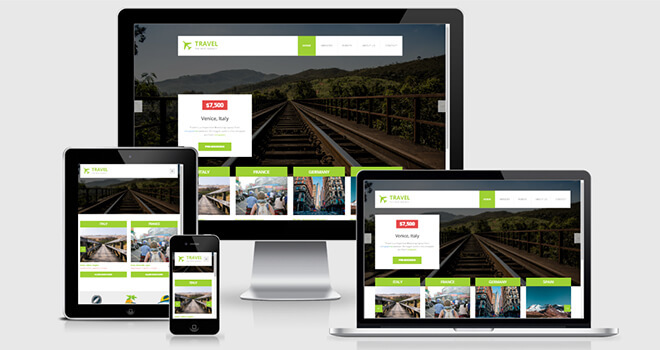 Travelia is a fresh new Free Responsive HTML5 Bootstrap Template which helps you to build such site as the travel agency, travel planner, travel guide, tour and travel, hotel booking, car rental and train ticket booking. 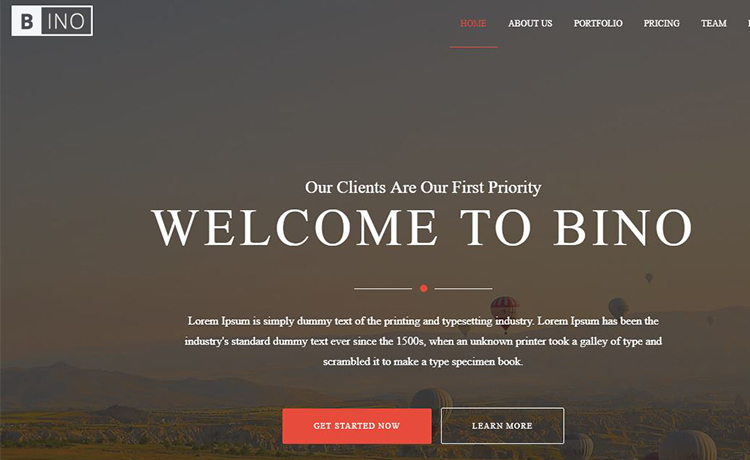 This lightweight Free Responsive HTML5 Bootstrap Template built on Bootstrap grid system. 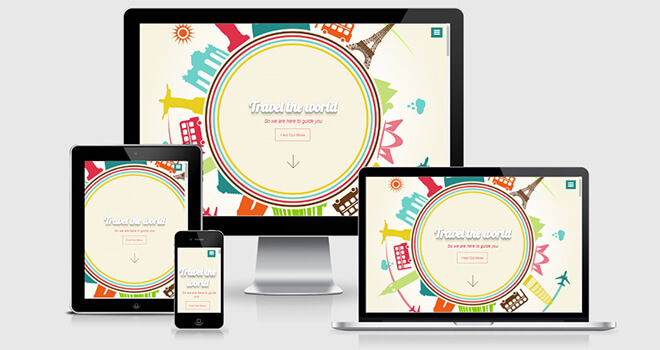 All the important sections for a travel agency website are met in this template. Check it by yourself. Well-commented markups will help you during modification. You can modify Travelia within a short time without any hassles. 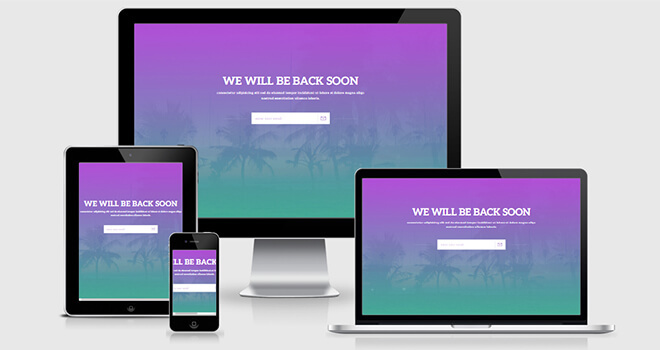 If you are looking for a Free Responsive HTML5 Bootstrap Template, then Travelia is for you. 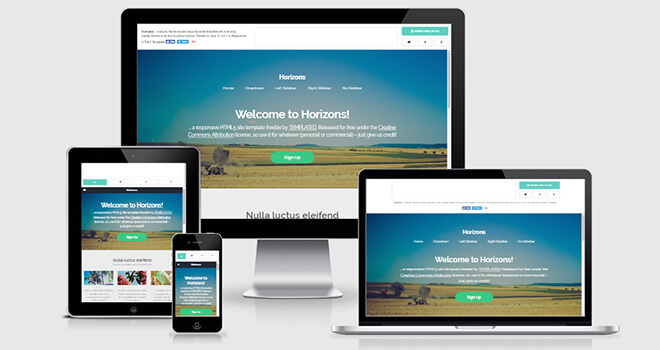 Horizons is a fresh new Free Responsive HTML5 Bootstrap Template comes with the sections that help to run travel agency website. The Templated Team used skel framework which provides it a 100% responsive layout. It is very lightweight and easy to customize. The well-commented and well maintained W3C valid codebase will help you to find and modify the content quickly and easily within a short time without any hassles. If you include meta information, Google will rank your page. If you are searching for a multipurpose and multipage Free Responsive HTML5 Bootstrap Template for your travel agency website, you should get this one. Travel Mate is a travel category flat free responsive Bootstrap template. It has the relevant sections that help you to run travel agency or travel guide or travel planner website. This free responsive template based on Bootstrap grid system which provides it a perfect shape for each device. Trip Way is very lightweight too. It contains only relevant sections without any junk component. This well documented template is very easy to customize. You can apply this SEO friendly template to your upcoming travel agency website within a short time. Miami is a fresh new HTML5 template comes with the sections that helps to run travel agency website. The Templated Team used Bootstrap framework to make this 100% responsive. Relevant sections such as Home, About, Gallery, Consultation, Testimonial are attached into the header bottom position. Also with, it has the relevant component which is the core need of a travel related website. The Miami has the W3C valid well-commented markups that help you to modify it within a short time without any hassles. Technology Used: HTML5, jQuery, CSS3, Bootstrap 3, Google Fonts. Now, people are smarter than previous. Before traveling to memorable their vacation, they check the traveling facilities including hotel booking, flight/train/bus ticket booking, availability of tour guide, etc. If you the business of these categories and want a website to provide these facilities to enhance your business, Govihar is the best Free Responsive HTML5 Bootstrap Template for you. It has 19 HTML files including Travel Agency, Hotel, Bus and Train ticket booking system. Besides, It has 100% responsive layout, elegant design concept, well-commented W3C valid markups. You can easily modify this SEO friendly template. Technology Used: HTML5, jQuery, CSS3, Bootstrap3, Flex Slider, Font Awesome. 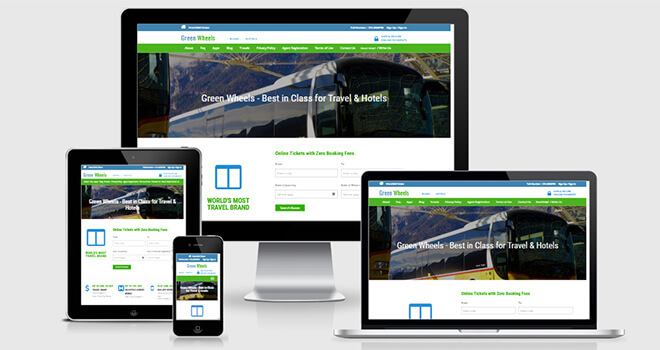 Green Wheels is a HTML5 free responsive Bootstrap template prepared for the travel agency website. The W3Layout Team used Bootstrap framework to make it 100% responsive. It has elegant design concept with the required functionalities for any travel related websites. Also, This template has well-commented sections which help you to find and modify that easily. It is a 100% SEO friendly template. Check the demo for more authentic information. Technology Used: HTML5, CSS3, jQuery Plugins, Bootstrap 3, jQuery UI, Font Awesome, Animate.css, Wow Animation. Flyer is a Free Responsive HTML5 Bootstrap Template comes with the sections that help to run a website like the travel guide, travel agency, travel planner, etc. This fantastic website template contains those elements which are the basis for a travel related website. It has 100% responsive layout for the Bootstrap grid system. It also has been built with beautiful design concept aside well-documented markups why it is very easy to customize. Technology Used: HTML5, jQuery, CSS3, Bootstrap 3, Font Awesome, Animate.css, Wow Animation. FPlus is a creative HTML template for the creative people. To be honest, collapsible burger menu is the most scintillating part of the entire template which opens wide just on click. And it holds menu items on the left and social icons on the right, both positioned vertically. As social signals are important for these days this template has the options for social icons on two places. First on the menu and then on the footer. A clean and wide contact form comes with custom Google Maps beneath it. Besides the repeated menu on the footer there’s an email subscription box also. For a better UX, the back to top button will take the users from the bottom to the home straight. Solid State is a creative template. It has the unique layout. People love this template because it is different than the regular free templates. This template can be used for many purposes. You can use it for a personal website template, blog template, landing page and so on. The template has an elegant style which will grab the attention of your visitors. Cluster is a Free Responsive HTML5 Bootstrap Template with clean design and fresh color template. 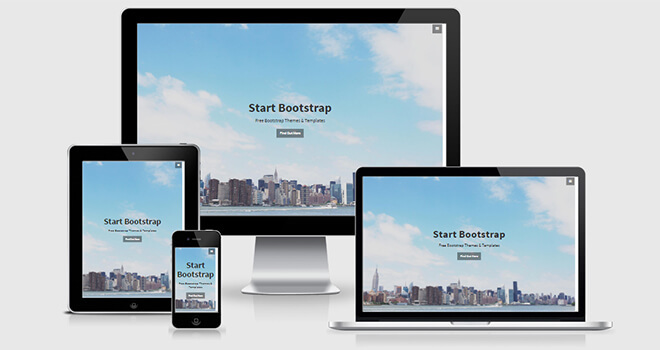 Shapbootstrap is a famous company for awesome bootstrap templates. They often release free HTML Bootstrap templates for their visitors. This template is also a great creation for the bootstrap lovers. Although it’s a creative template, it has multipurpose utility. 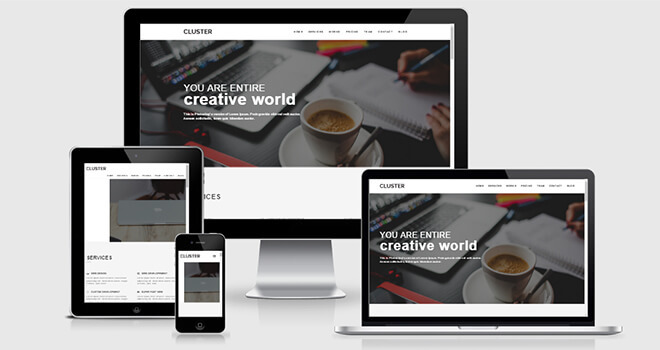 The Cluster is a Free Responsive HTML5 Bootstrap Template. You need to create an account to download the file. That’s all! Creative is a free template created on HTML5 and Bootstrap technology for portfolio presentation. 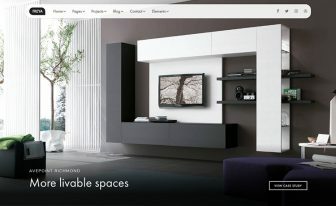 From many free HTML templates, we’ve chosen this particular item by considering its visual appeal and stylish design. The developer of the template meticulously picked the color and typography to make the site more user-appealing. Technology Used: HTML5, jQuery, CSS3, Font Awesome, Owl Carousel, Google Fonts. 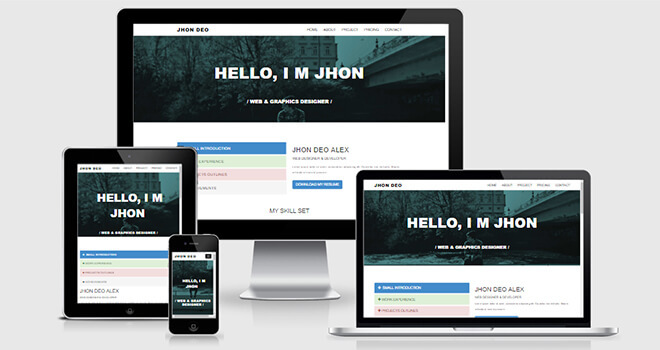 John Doe is another free yet outstanding HTML Bootstrap template. When you’re spending your valuable time to find a demo site that can totally serve your purpose here, the template comes. We handpicked this template considering its global standard design quality, fresh color template, solid typography and above all its multi-functionalities. To go tension-free with creating a website this free template will come handy at a grand level. You can understand soon why we praise so much about it right after downloading the template. White isn’t just a random web template we’re telling you to get for your best purpose. Instead, it has beautiful design architecture and compelling features so that the user will feel there’s something less. 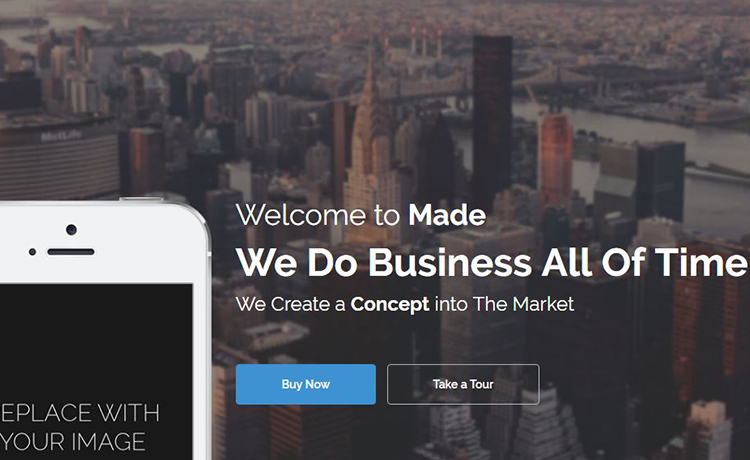 This amazing template will help you to take your business to a professional level. The typography, trendy colors, practical design and impressive look, make the site more valuable. Although, it’s a template that doesn’t cost a penny yet it has all the features like a premium quality template. 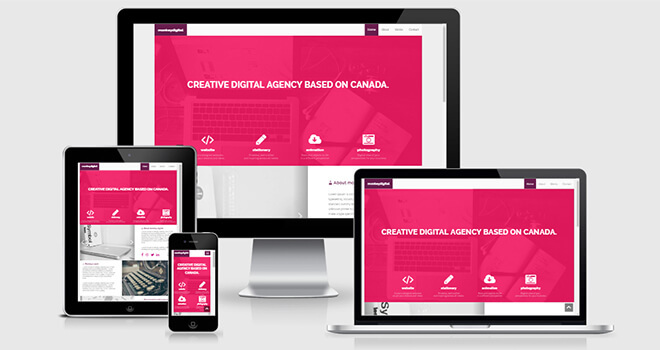 Creative is a one page HTML Bootstrap template for multipurpose use. The design of the site is elegant, and the color themes are fresh. Also, the site includes multiple features and a bundle of plugins that allow you to do more. You can use the template for any Bootstrap based project without apprehension. 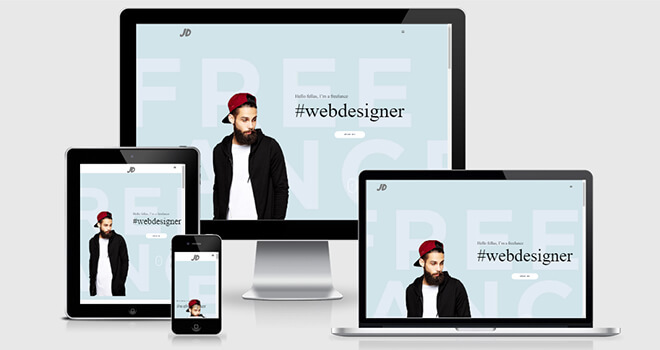 JD is a clean and fresh HTML Bootstrap template for personal use. It is one of the best free templates that could serve your purpose with great satisfaction. The site has accurate coding and better user experience than any other free site. If you’re looking for a working template but didn’t find anyone, then your were probably in the wrong place. Because we have compiled up this huge list to save your money and time. 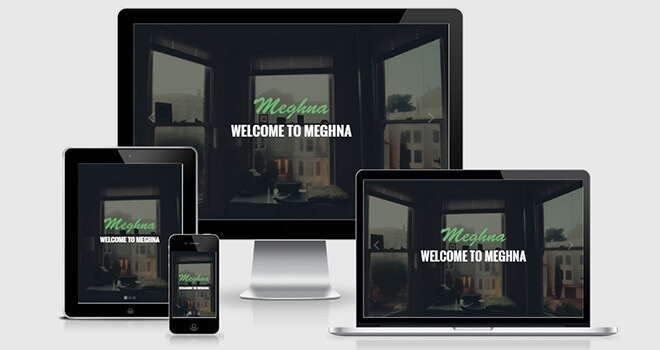 Meghna is a wonderful template for various use. Following burgeoning web trend, this free site will let you do things effectively and accurately. Some free template are even better than paid template. It is one of these kinds. Our big collection allows you to choose the exact template. With modern technologies and creative ideas, this particular template is a big strike. Oxygen is a free yet power site having more potentials in it. You can do a lot by just grabbing the template with one click. The site is free to download and easy to customization. The designers thought in a broad sense so anyone can apply that to their private project. In this modern template, you will find all the up-to-date technology including HTML5, CSS3, Bootstrap3 and much more. 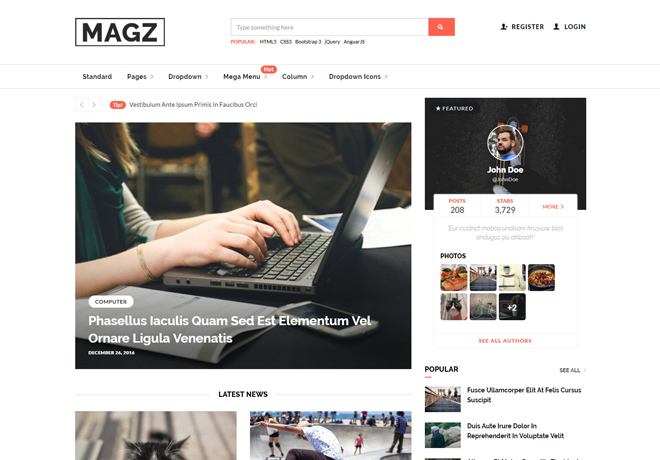 Magz is free HTML blog template that enables users to be more creative and efficient. It has a lot of ready pages for instant usage. Since the arena of blogs is so large that people can start with any topic, Magz help them to build that with their freedom and comfort. Also, Magz includes on-hover animation, mega menu, sticky navigation, and other advanced options. Let’s create what you have been desired for. 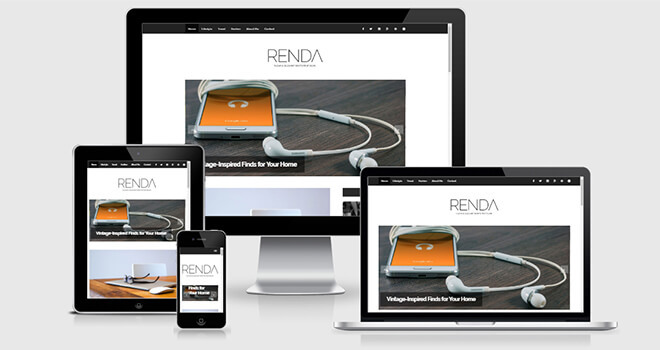 Renda is a clean bootstrap template. It’s a high-quality free HTML5 template for blogging. The template is perfect for personal, travel or fashion blogs. There is a slideshow, right sidebar in this free blog template. The template is light weight, easy to customize and 100% responsive. Fits perfectly on any device sizes and in any browser sizes. Future Impact is cool template. It’s one of the best HTML5 templates for the blog. There is only a handful amount of free blog website template exists in the world. And this is one of the best. The typography is very good. So, you can read the text, headline, and other stuff easily. The button styles are clean and easy to navigate. The background color is gray, and it’s perfectly blended with the font color, heading color and imagery. Clean Blog is free template based on HTML and Bootstrap. Because you are looking for a template that is pretty functional as well as free – we have collected all these beautiful items and this particular one. Like its name, Clean Blog is truly clean with its subtle color and robust typography. Normally the aim of a blog is to give the reader a comfortable space. Hence this site has perfectly done that job. First of all Moonlight isn’t an ordinary template comes with what we see everyday. The horizontal sliding layout is one of its kind and truly engaging with a dark scheme. The navigation stays on left side and works smoothly on the click. Section-wise background image makes Moonlight unique in terms of visual interface. Additionally, contact form and Google Maps both are useful to connect more people. 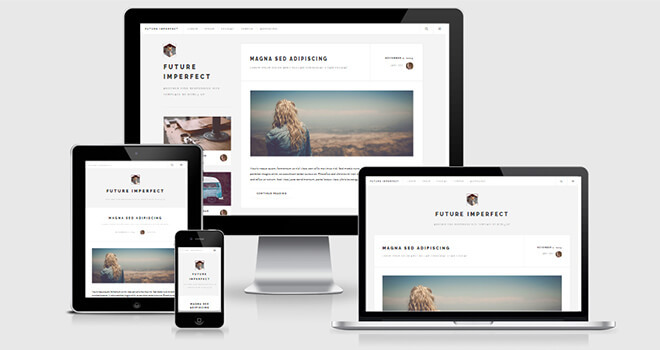 Multiverse is a free HTML5 template. You can use it for a photography website. This is a simple template what most of the photography likes. They want a sleek and clean website with minimal features. Their main purpose is to showcase their awesome snapshots and pictures. When you click on a single item, it opens as a popup, and you can navigate through more photos with the next and preview button. This template is sliced up with the pieces of HTML5, CSS3, jQuery. Lens is crafted nicely for the photographers. All the photographers who need a simple, yet beautiful and functional photography website template, they can download this photography template free and launch their website in no time. There is image slideshow, enlarging photo option, social media icons, and links, full page image slider. You can show all of your cool pictures, shots, snapshots, images, portraits in a nice way keeping the frame, exposure, iso, shutter speed, lighting, etc. as it is. The image quality will be the same just like the way you capture it. This is one of the best free templates for the photography website. 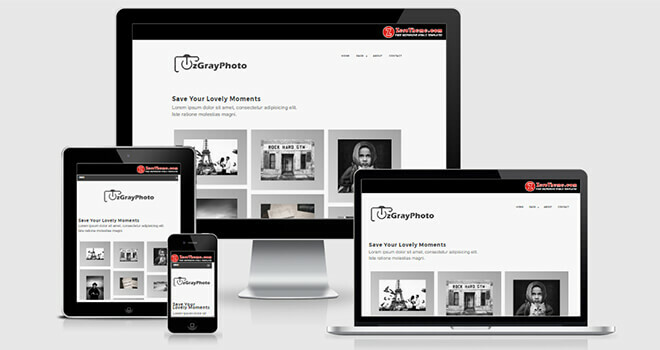 zGrayPhoto is a clean and simple website template for photography. It has no extra designing burden that can make the site unpleasant to look. The girds are well-organized so that the photographer can display their works with better resolution. This completely free Responsive template has multiple pages including about us and contact page. To show your photography to the world get this free HTML Bootstrap template and start your site right away. Technology Used: HTML5, jQuery, CSS3. 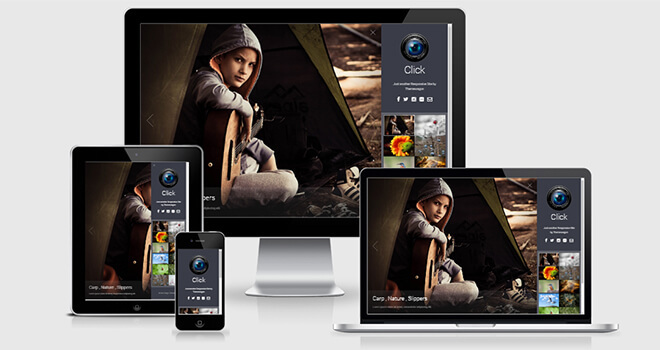 Photographer is a beautiful and functional template for photography. When you’re looking for a template that couldn’t affect SEO negatively and has a great appeal this wonderful template is the right choice for you. Regarding every single measure of design and development, this site is top-notch. You can easily keep this site in your favorite list. When they created the site, they tested everything that concerns a site’s functionality. 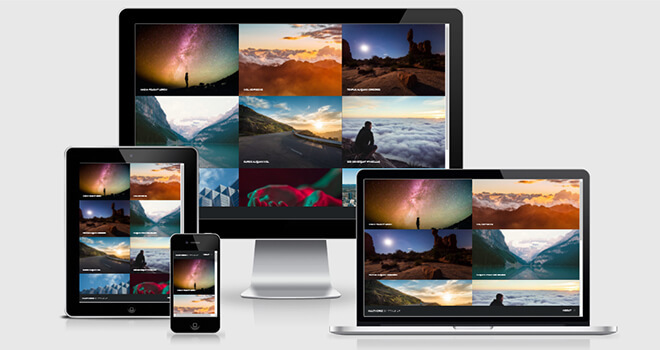 Click is a free HTML Bootstrap photography website template. A passionate photographer needs a perfectly designed website to put their best work for presentation. 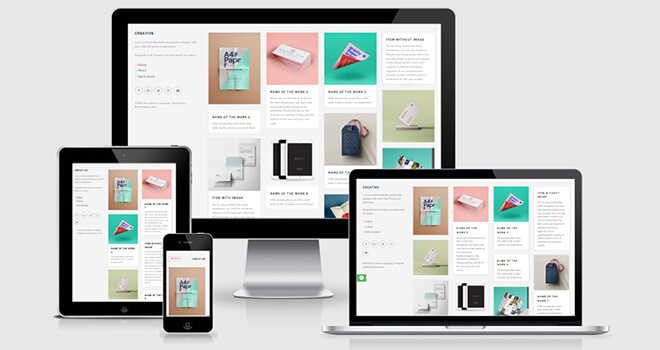 This premium quality free site comes handy for creating an elegant portfolio. The sticky header and full-screen image background give the site very professional look. If you’re looking for a photography template, then this template is the right pick for you. Just click whatever you want and show the world with this fantastic photography portfolio site. Based on Bootstrap 4, Fitness brings you a lot of first-class opportunities to make a great website for fitness. If you start scrolling once, the navigation will be sticky. Since the template is optimized for mobile there are many options appear only on mobile devices. For instance, user will see a slide-out navigation only in the small devices. It’s a one page template and it’s enough to make a super website if customized appropriately. The dazzling color also grabs attention of the users. 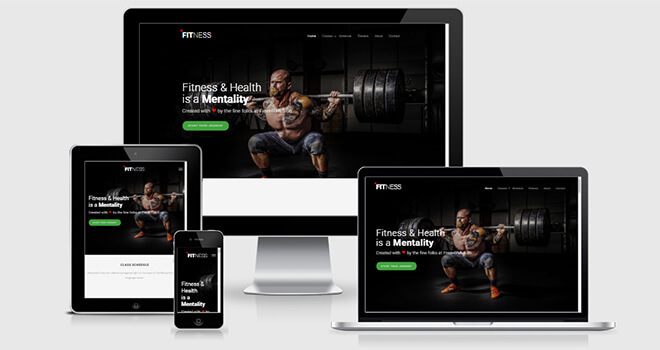 Fitness is a free HTML5 Bootstrap template designed with HTML5, Bootstrap. It is a good template built for the gym website. Any instructor can build his/her personal training website with this free Bootstrap template. The template has a lot of sections. Most of them have cutting-edge, modern design with good typography and layout. The template has parallax section, features section, schedule section, smooth animation etc. Fat Burn is a Free Responsive HTML5 Bootstrap Template for fitness club. The site is well-decorated with important sections for putting information about your club. It also has a contact page with Google Map so that you can add your precise location and let the customers to get connected to you. 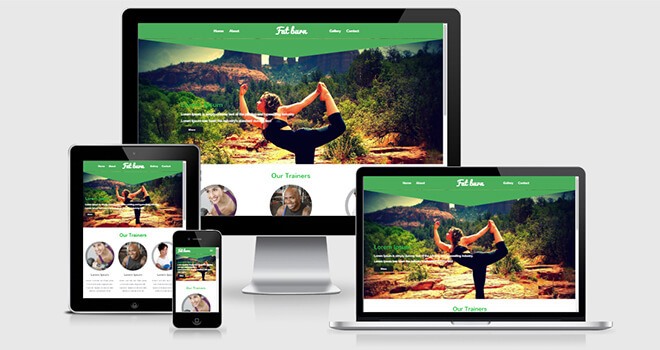 Fat Burn is a multi-page responsive website template with beautiful design. One can download it for free to launch their business site. Cardio is a lightweight and pretty-looking free HTML Bootstrap template. It has a sharp design with awesome color effects for gym-style business. I love this template for its solid typography, multiple sections, swift page navigation, and cool transition effects. 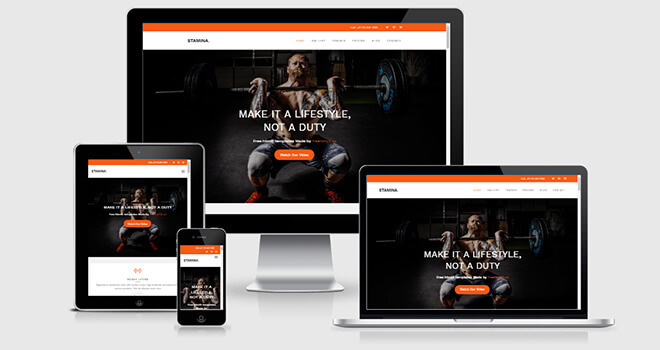 For your gym or fitness related business use this free HTML5 Responsive template. You can save your time and money with this fresh template. Technology Used: jQuery, Bootstrap, Owl Carousel, WOW.js, jQuery One Page Nav, Animate.css, Font Awesome Icons, Elegant Icons. Fitness is an outstanding template based on HTML5 and Bootstrap3. This site has the unique design and professional layouts. It is an ideal template for gym style business with gorgeous color and solid typography. If you’re in any fitness-related business or even if you get an order to make a site for a client who is involved in such business then, this template is the right pick for you. 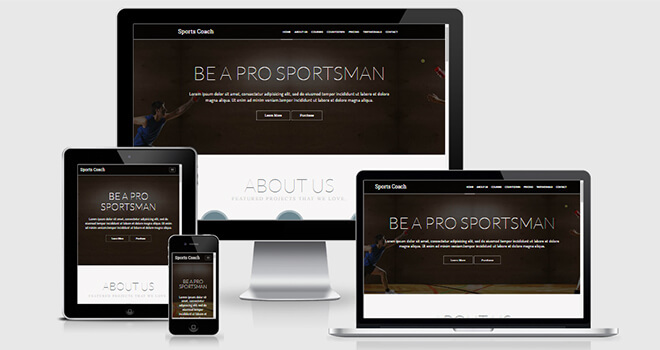 The Sports Coach is a Free modern HTML5 Template. It is perfect for Sports, Gym, Yoga or any related fitness websites. The TechNext Limited developed Sports Coach with the power of Bootstrap Grid System. Therefore, it’s 100% responsible. Also, they used the latest web development technologies such as jQuery, animate.css, and modernizr to Build this template. Besides, it is an SEO friendly template too. All markups are W3C valid and error free. The developer team prepared documentation so that you may make changes or add content. Also, they attach comments before each section. So, you can easily find where to make changes. Though it’s a Fitness purpose, by modifying, you can use it for any other purposes!! Therefore, you can use it as a multipurpose template. After all, It is excellent from every aspect. Technology Used: HTML5, jQuery, CSS3, Bootstrap, Fontello, Modernizr. 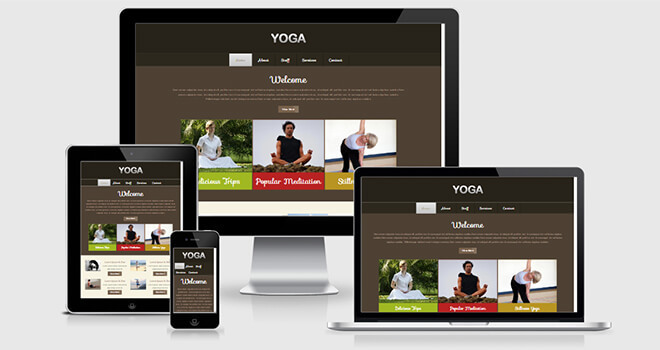 Yoga is a free HTML5 Template especially for the Yoga and Meditation. The W3layouts team built this in such a way that you can choose this multipage responsive template for your gym center, fitness club, beauty parlor or else. They develop The Yoga with the power of Bootstrap Grid System. Therefore, it’s 100% responsible. Also, Yoga is an SEO friendly template. It contains error-free W3C Valid markups. Also, The developer team prepared documentation and commented each section. Therefore you can easily find where you want to change. 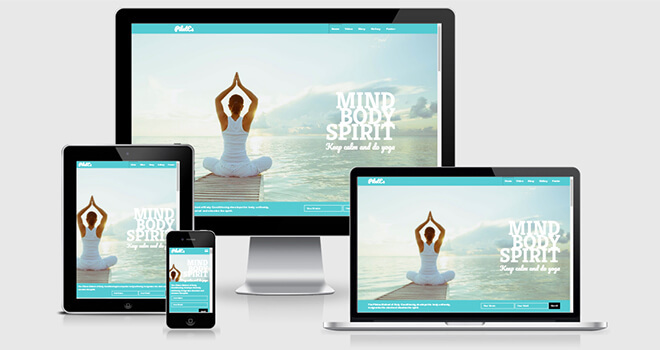 After all, The W3Layout team has designed Yoga especially for you which is FREE! Moreover, It is perfect from every aspect. Technology Used: HTML5, jQuery, CSS3, Bootstrap, Google Analytic. 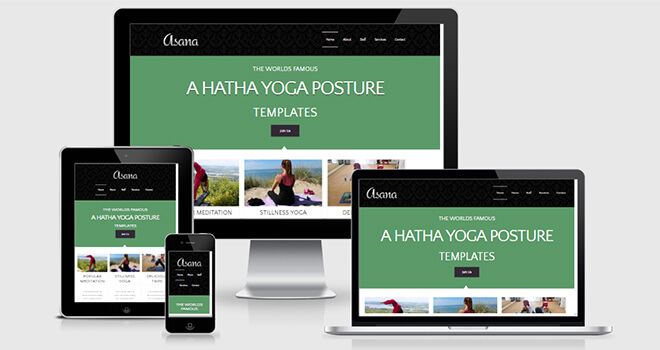 Asana is a Health and Fitness Category free HTML5 Bootstrap Free Template. The W3Layout team developed it as the way that a user can use it to start a website for gym centers, fitness clubs and beauty parlors or else. 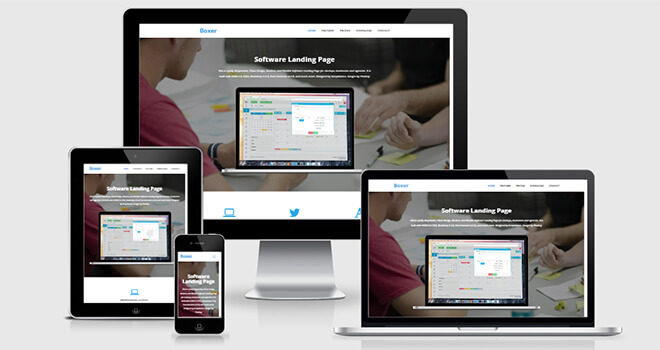 The Developer team uses Bootstrap Framework to make it 100% responsive. Therefore, it fits on every device like all the mobile devices, tablets, laptops and PCs. Also, The Asana is an SEO friendly template. It holds W3C valid markups. Each HTML element has the start and the end tag. The developer team attached comments before each section so that you can easily find these. Also, they prepared an enough documentation so that you may make changes or add content. Though it’s a medical purpose, by modifying, you can use it for any other purposes!! Therefore, you can use it as a multipurpose template. After all, The W3Layout team has designed Asana especially for you which is FREE! Moreover, It is an excellent template from every aspect. Technology Used: HTML5, jQuery, CSS3, Bootstrap3, Google Fonts, Google Analytics. Pilates is a coaching website template especially for the fitness and yoga coaching. It’s a one page HTML5 Bootstrap Free Templates. If you are a coach or a trainer you can choose this template. The Technext Team developed Pilates with the power of Bootstrap. So, it’s 100% responsible and fits on every device. Pilates is an essential Coaching Website Template. The developer team had designed it especially for The life coaches, consultants, and instructors. It is an excellent template from every aspect. Besides, The Pilates is an SEO friendly template. Every markup is W3C valid. The developer team attached comments before the element so that you can easily find sections. Also, they had prepared a sufficient documentation so that you can make changes quickly. Though it’s a coaching purpose, after modification, you can use it for any other purposes! Therefore, you can use it for multipurpose. After all, Pilates is Completely FREE to use for personal and commercial use. Technology Used: HTML5, jQuery, CSS3, Bootstrap3, IonIcons. Stamina is a modern free HTML5 Bootstrap Free Template which is perfect for gym, yoga or any related fitness websites. Therefore, it’s a multipurpose template. The FreeHTML5 team develops Stamina in the power of Bootstrap. So, it’s 100% responsible. It fits on every device like all the mobile devices, tablets, laptops and PCs. Also, The Stamina is an essential Medical Website Template. It has an off-canvas, tab content for schedule, pricing table, and much more. Built with the latest technology like HTML5, CSS3, jQuery and Sass. Besides, it is an SEO friendly template too. The developer team prepares an enough documentation so that you may make changes or add content. They attach comments before each section so that you can easily find these. Though it’s a Fitness purpose, by modifying, you can use it for any other purposes!! Therefore, you can use it as a multipurpose template. After all, The FreeHTML5 team has designed Stamina especially for you which is FREE! Moreover, It is excellent from every aspect. Technology Used: HTML5, jQuery, CSS3, Bootstrap, Google Fonts, Owl Carousel, IcoMoon. Coming soon pages comes handy when your site isn’t ready yet and you want to engage with the future users. Coming2Live has the full power to make your under-construction pages more interactive. Now you can amuse visitors with the 10 demo variants this template offers. Besides that, each template contains social icons, countdown timer, and copytext. Set your brand color in the solid color background. If you decided to go with a static image then choose the image wisely. In like manner, the video background, slideshow and more varitions are waiting for your call. 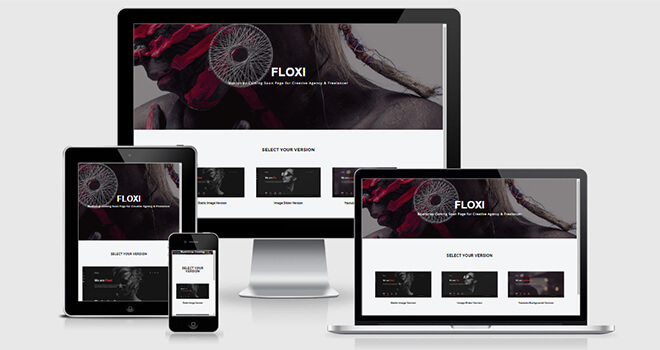 Floxi, a good template for designing your coming soon page. This is a free bootstrap website template which comes with three different header styles – Static image, Image Slider and Video background. The design is big, bold and has a dark color scheme. Black gives it an elegant look and feel. There is nice CSS3 animation, icon menu, left sidebar, social media icons and so on. 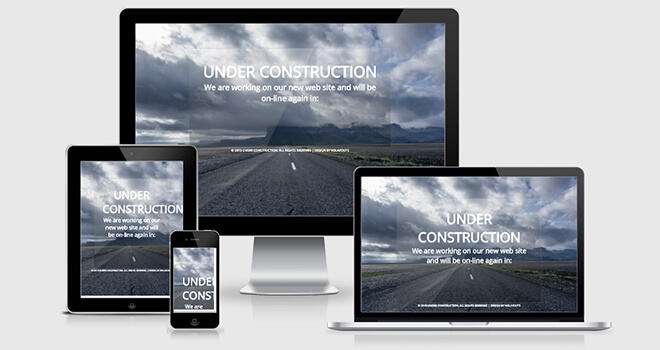 This is a really good quality free template for coming soon, under construction website template. 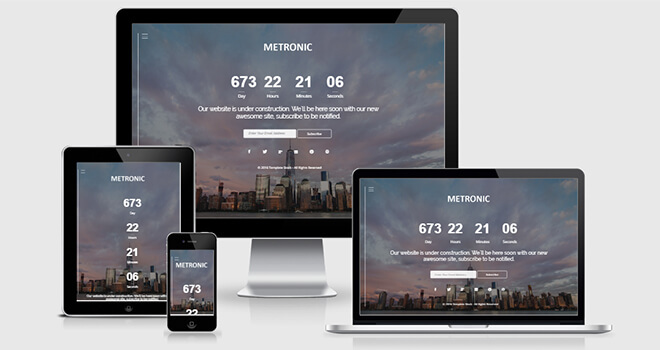 Metronic is a free coming soon bootstrap template. This is called Coming Soon template, but it has other pages as well – about, team, services, portfolio, and contact. This free HTML5 template has a unique and different navigation. The CSS3 animation looks cool here. There are time counter and email subscriber for the early users. N.B. Don’t get confused with the original Metronic admin template. 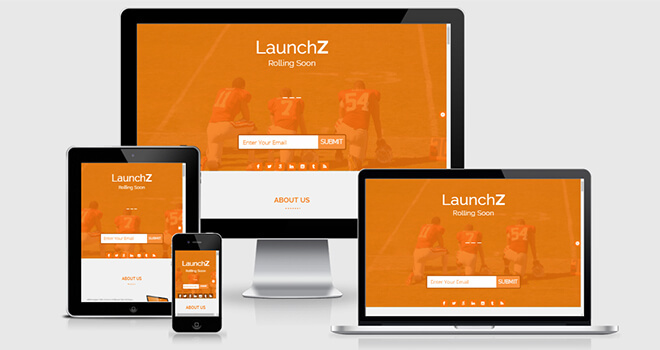 LaunchZ is a free template based on HTML5 and Bootstrap3. 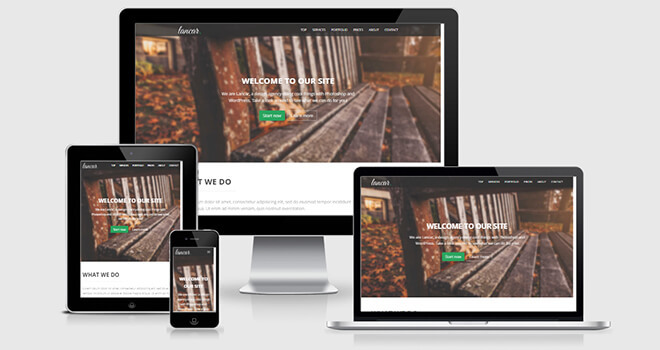 This fully responsive template is a great product to have in your cart without spending a penny. Its beautiful design, responsiveness, eye-soothing design, smart typography, and bright color scheme make the site a desirable one. Seriously, it worth to pay for it but fortunately you don’t need to do that. With many essential sections and better placing of different segments, LaunchZ is an entirely useful HTML Bootstrap template. Create an account there and start enjoying the functionality of it. Layla lets you save your precious time with valid coding and perfect design. Don’t get stuck to find the right template for your need while there’s this free HTML Bootstrap template available to download. We made this bulk collection because we appreciate our reader’s visit to our blog. Amid all the beautiful, sleek templates this is one of the great. Don’t wait to think whether to take it or not. You’re running out of time and here’s a fully functional template just to install and modify. Get this template right away and save hours of coding and checking. Awesome Before going live with the final version of your site you need to keep your customers on hold with warm promises. With a freshly designed “coming soon” page they will understand you’re going to bring something grand. The aim of this kind of page is to get your customers connected even when you’re not in business. Let’s take the page and stay attached to your visitors. Comingwa is free coming soon template. The CodexTree team used some awesome latest technologies to develop this template. They used Bootstrap frontend framework for its layout. Therefore, It becomes a clean, modern, and responsive template. This template is fit correctly on all devices. The Comingwa is an SEO friendly template. It includes meta tag so that you may include meta information. After adding these, Google will rank your web page. Also, The Comingwa contains about, service, team and contact section. About, service and team section introduce your organization to the entire world. Active communication section also helps your clients to communicate with your team. After all, It’s a perfect template for you and your organization. 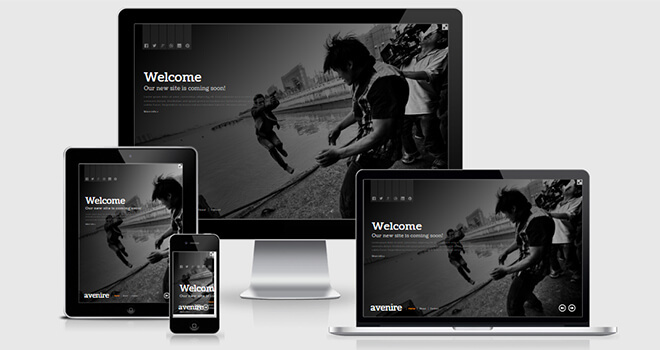 Avenir is a “Coming Soon” Free Responsive HTML5 Bootstrap Template. It is a clean and modern, Under construction template. The Avenir has something different. The developer team implements new design concept to attract its visitors. They crafted it with love by their customer’s desire. After all, You will appreciate its design concept. It comes with a full-screen slider, multi-page content, full-screen mode, and social links. The WeGraphics Team built it with the bootstrap. Therefore, it is 100% responsive. Also, The Avenir contains W3C valid markups. Every section has well commentation. Therefore, without any hassles, you can launch your page within a short time. You can download The Avenir as free under this license. Above all, It is one of the best Coming Soon template. Of course, there is no such template away! Using Avenir, you can notify your viewers about your works. 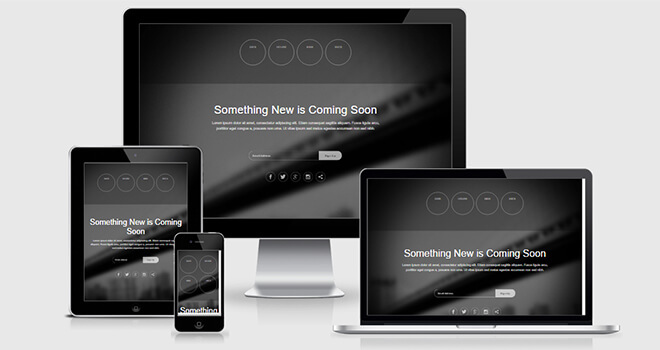 Notify is a coming soon Free Responsive HTML5 Bootstrap Template. Besides, One can use this as an Under construction template. Also, it has a countdown timer. Using Notify, you can inform your viewers about your upcoming events and date of releasing your complete website. The Pixelhint Team built it with the Bootstrap built-in grid system. Therefore, it is 100% responsive. Also, The Notify contains W3C valid markups. It comes with a countdown timer and email subscription form. Each element of its has the starting tags and ending tags with comments too. Therefore, without coding knowledge, you can launch your page within a short time. Besides, The Notify has something new. The developer team implements new design concept to attract its visitors. They put their best effort to fulfill the desire of their customers. After all, You will appreciate its design concept and can use it for personal and business use. 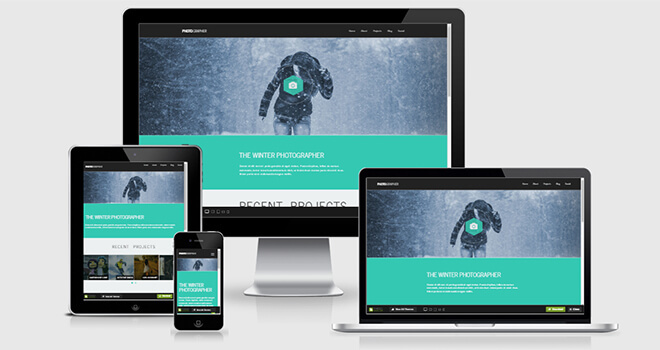 W3layouts provides you the Construct template for free which is responsive. It contains W3C validated pure HTML5 and CSS3 markups. Also, The developer used jquery timer for countdown representation. Besides, It is an SEO friendly template. Why does a site need an Under Construction Page? Let, you are working with any of your pages. In that time, if any of your client or just a visitor visits on that page, they may fetch problems. Here, Under Construction Page solve your problem. It provides a message to a visitor. When they go to a link to this site which is under process, they see that! 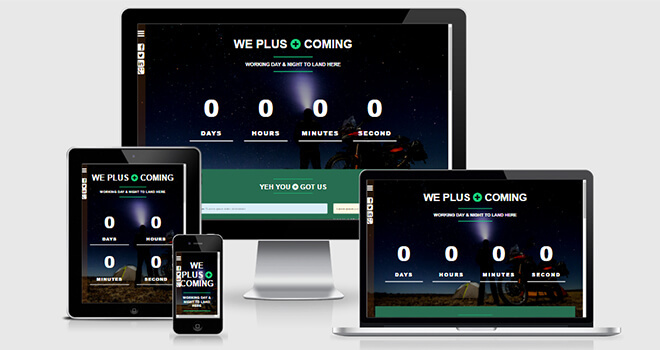 We Plus Coming is Coming Soon Landing Page Template. The developer team formulated it using Bootstrap frontend framework with love, So, it is entirely a responsive template. You can use this for your upcoming website. It holds W3C valid and error free code. We Plus Coming comes with four different versions. These are the slideshow background, video background, image background and color background. Also, it is an SEO friendly template. After adding that, Google ranks your website. It is a flexible template to customize as your requirements. For yourself, We Plus Coming is free under the Commons Attribution 3.0 license. You can use any of these versions, which suits you. Also, Use it for personal and commercial work. Technology Used: HTML5, jQuery, CSS3, Bootstrap3, Font Awesome. Dark is a free one page coming soon template. The W3Layouts team used the latest technologies to develop Dark. They also used Bootstrap Grid System for its layout. Therefore, It is a clean, modern, and responsive template. This template is fit correctly on all devices. The Dark is an SEO friendly template. It includes meta tag so that you may include meta information. After adding these, Google will rank your web page. Email subscription form also helps your clients for their quick subscription. Also, your customers will attach with you through social links. After all, It’s a perfect template for you and your organization. You can easily merge it with your website. Produkta is a free one page coming soon template. The AZMIND team developed The Produkta with the touch of the latest jQuery technologies. They also used Bootstrap Grid System for its layout. Therefore, It has a flat, clean, and modern design with the responsive layouts. It is compatible with all major browsers and 100% SEO friendly. It holds countdown timer that will also let your clients know when you are going to launch it. Also, your customers will attach with you through social links. After all, It’s a perfect template for you and your organization. You can easily merge it with your website to show your upcoming projects or website. 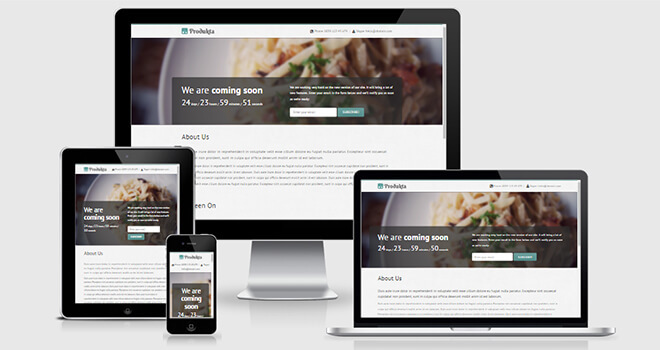 The widget is a flat responsive coming soon template for your under construction website. It is elegantly designed using HTML5 and CSS3 with a jQuery animated countdown timer. It has a different stylish background with rainy windshield railroad view. The template Widget would be usable for forecasting your Project’s progress with a surprising Animated Countdown Timer. It holds Newsletter subscription form so that the user might get the quick subscription. Moreover, The Widget is absolutely FREE to download, and you can use in your Web Projects. 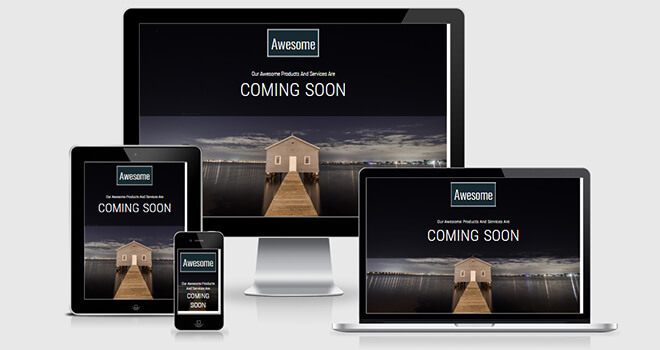 IMPRESSIVE is a Coming Soon UNDER CONSTRUCTION template. 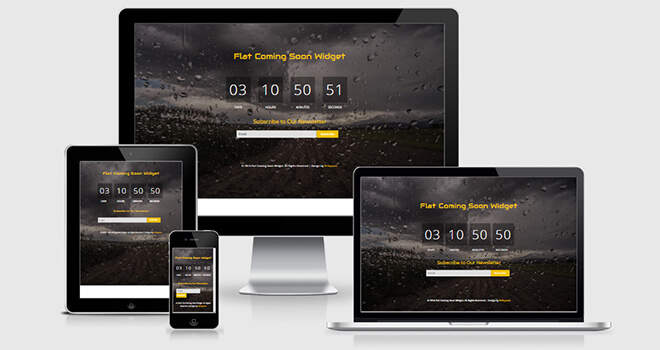 This is a Flat Widget Responsive Template with a Mesh layered Hilly panoramic background image. The W3Layouts team built this template on the base of HTML5 and CSS3. They also used the latest technologies and concepts. The Impressive has digital countdown timer with the active countdown progress bar. 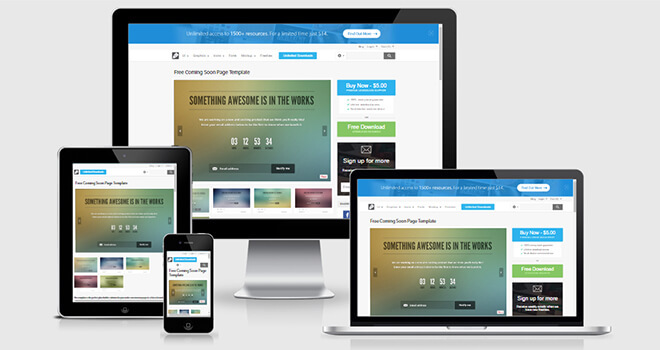 Impressive is a 100% responsive and free template. You can use it to let your clients know what you are going to upload soon. Impress your customers with this impressive coming soon template. 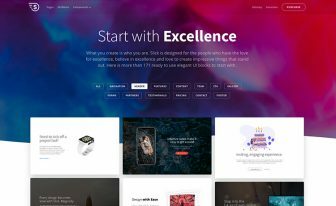 Comix might be the best Coming Soon template for your upcoming website. The Dreamstale developed this template on behalf of the W3Lyouts. They built The Comix with W3C valid HTML5 and CSS3 markups. They also used the latest technologies. 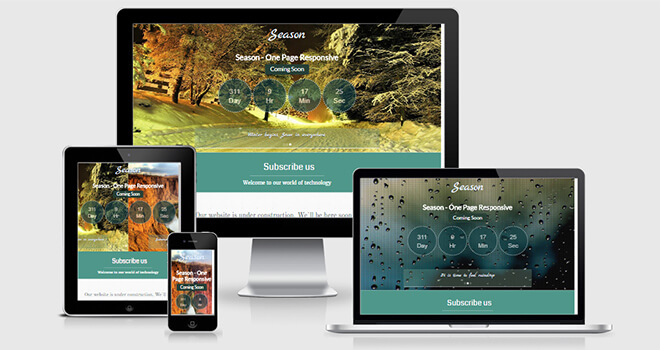 Its 100% responsive layout and the animated countdown timer will surely catch your customer’s attention. Try it today. There’s nothing to loose to use it on your site. Moreover, It’s entirely free. Download and enjoy its taste. 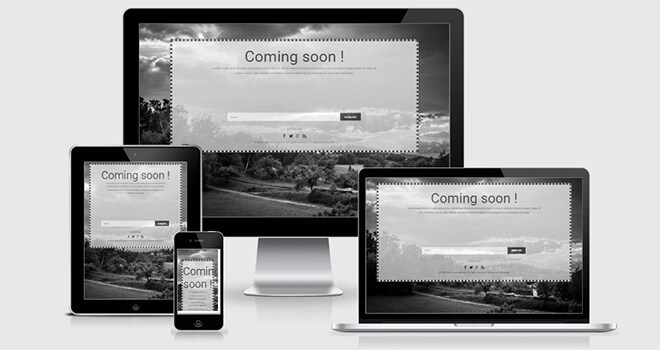 The Medialot Coming Soon Page template is the ideal placeholder solution for your under construction web projects. This has a beautifully blurred five different color background that adjusts to fill the screen. Also, In this template the Medialot team attached an active Jquery Countdown timer. The whole code structure is well commented and documented so that one can easily handle it to apply. It is an error-free template and completely responsive. Also, there is a functioning email subscription form for customer interaction. Please, read the attached license in the downloaded file before use it. The Flat is a coming soon widget template. The Flat has a rainy windshield street view background image which will catch the eyes of your clients. The W3Layout team built this template with error-free W3C valid HTML5 and CSS3 Markups. It would be handy for forecasting your Web project’s progress with a Countdown Timer and Newsletter subscription options. It’s very easy to use. So, you can use it without any hassle in your Web Projects. 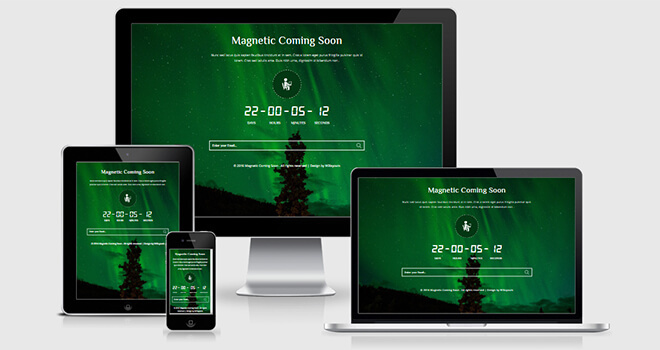 Magnetic is a Flat Responsive Widget Template. It is scenically designed with a Cosmic Landscape background image. The W3Layout team developed it using W3C valid HTML5 and CSS3. Therefore, It is 100% error free. Also, They attached an active jQuery countdown timer so that it would be handy to forecast your Project’s progress. There’s also an Email subscription field for Updates. After all, Magnetic coming soon template will surely attract your customer’s attention. Get Avalon the free event website template built with Bootstrap and other modern techniques. The interface is truly stunning while people must love the features integrated to make their experience better. Among the myriad features, masonry blocks are the most significant part. Also, there are options for enlisting events, putting social media profiles, and contact details. Since the template is for events one can take it to build a website for conference, convention, and meeting. The Weddo is a event planning free HTML5 template. The html5xcss3 team creates it with HTML5, CSS3, Bootstrap3, and jQuery. It’s a wedding website content that you can use it both personal and commercial use. Now, many clients browse websites from the handheld devices. So, the developer team has designed the Weddo on the mobile first concept. They create the layout of this template with the touch of Bootstrap Grid System. Finally, Before launching, the team tested it on every device. Besides, The Weddo contains W3C valid markups with Meta tags. Every HTML element is error free, and the sections are separated by comments. So, You can modify it without wasting too much time. After all, it is completely free template! 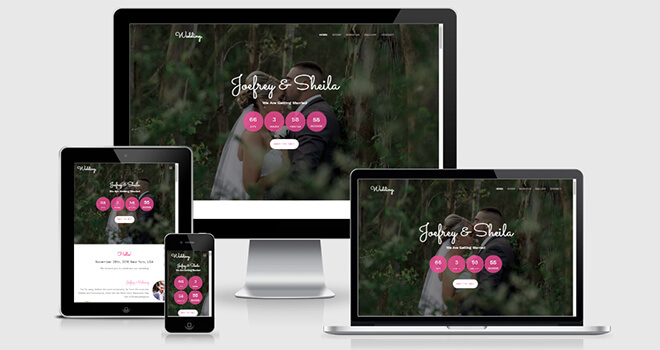 The Wedding Master is a wedding planning HTML5 template. The developer team creates it with HTML5, CSS3, Bootstrap3, and jQuery. As the name suggests, it’s a wedding website content that you can use it both personal and commercial use. Now, many clients browse websites from mobile phones. So, the developer team has designed it on the mobile first concept. Before launching, the team tested it on every screen size. 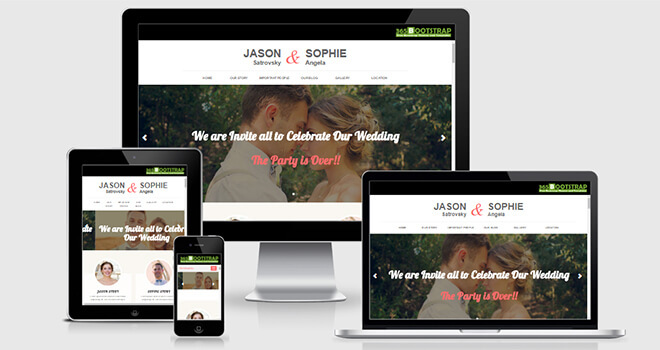 In a word, The Wedding Master website template comes with 100% mobile-responsive ability. Besides, The Wedding Master contains W3C valid markups with Meta tags. You can add meta information into the meta markups. Also, the developer team comments each section correctly. So, You can modify The Wedding Master without wasting too much time. Therefore, it is a 100% SEO friendly template. After all, it is entirely free template! So, you can download it to use on your projects. Technology Used: HTML5, jQuery, CSS3, Bootstrap3, Google Fonts, Modernizr. 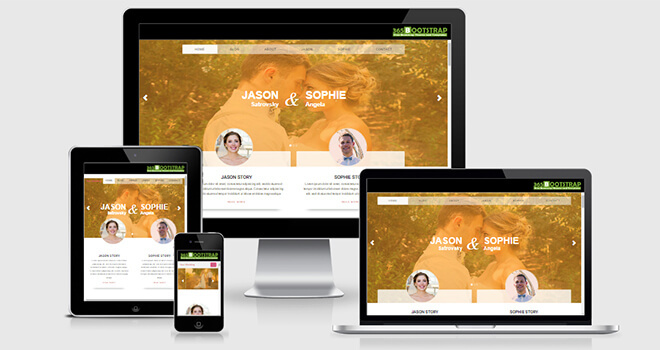 Spousal is a Clean and Professional Wedding Planner Template. It’s mainly for the wedding planners and event managers. So, you can use this template for any Wedding Planner websites. The developer built The spousal in a Decorative style. The alluring design of Spousal came out of HTML5, CSS3, and jQuery. The Colors, Icons, Animations, Countdown widget and Alignment make this an excellent template that will charm the guests. Also, the developer team uses Bootstrap Grid System so that it will suit on every device. The Spousal has a contact form so that visitors can register to attend the ceremony. Also, the developer team built it with a charm, and they commented each section. It has almost every section that you need. Also, it has excellent documentation. Therefore, The user can customize The spousal within a short time as per their requirements. Besides, Spousal supports W3C valid markups. Also, It is a 100% SEO friendly template. After all, it’s an ideal free template for an event handler. Technology Used: HTML5, jQuery, CSS3, Bootstrap. The Conference Lite is a event planning HTML5 template. The TechNext Limited creates it with HTML5, CSS3, Bootstrap3, jQuery and SASS. It’s an event planning website template that you can use it both personal and commercial use. The developer team has designed it on the mobile first concept. 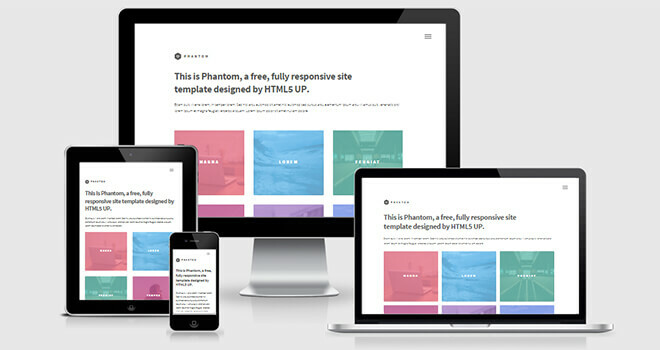 They create the template Using Bootstrap frontend framework. Besides, The Conference Lite contains W3C valid markups. It is completely error-free. Also, the developer team comments each section correctly. So, You can modify The Conference Lite without wasting too much time. It is a 100% SEO friendly template. After all, it is entirely free template! 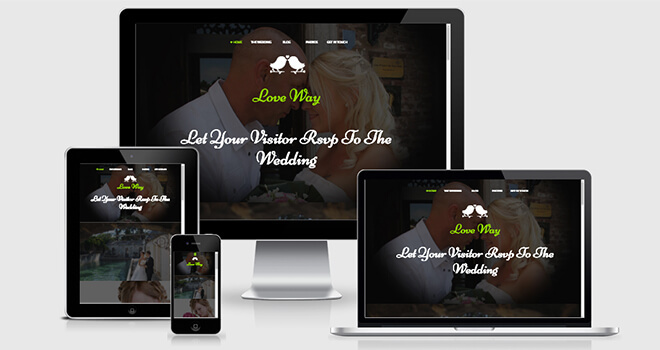 Love Way is a wedding planner Free Responsive Template. You can apply it to form a website for wedding planners, marriage brokers, marriage bureaus, and event makers. The Love Way has an imaginative design that h3love. The developer team created its layout carefully to build it simple to browse. They crafted it with the latest web technology like HTML5, CSS3, jQuery, and Google Analytic API. Also, they used jquery slider. The developer created it with Bootstrap Grid System. That is why The Love Way is an entirely responsive template and supports all browsers and devices. Besides, The Love Way holds W3C valid markups. The developer team comments every section therefore that you’ll customize it. You can modify The Love way within a short time too. Therefore, it is a 100% SEO friendly model. Do you want for a marriage event template? Then, it’s ideal for you. Using this one page wedding template, you can reach to store your memories! Technology Used: HTML5, jQuery, CSS3, Bootstrap, Google Analytic API, Modernizr. Wedding Day is a neat and clean free template. It’s mainly for wedding planners and event managers. The developer built The Wedding Day template in a Decorative style. The appealing design of Wedding Day came out CSS3 and jQuery. The Colors, Icons, and Animations make this an excellent template that will attract the guests. Also, Wedding Day has a contact form so that visitors can contact to attend the ceremony. The developer team used Bootstrap Grid System so that it 100% responsive. Besides, Wedding Day supports W3C valid markups. It has a documentation so that one can modify Wedding Day within a short time. It is a 100% SEO friendly template. in a word, It has almost every section that you need. After all, it’s an ideal template for an event handler. 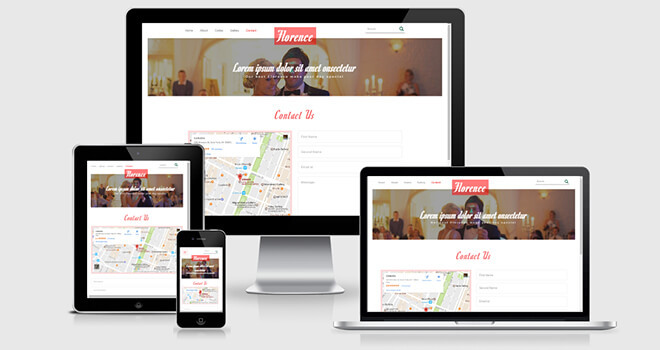 Florence is a clean, and Flat Wedding Planner Free Responsive Template for marriage planners and event handlers. You can use this template to build a website for wedding planners, marriage brokers, marriage bureaus, and event makers. Florence has a creative design that you’ll love. It comes with black and white header banner. The developer team built it in a Fancy style. Also, they used Bootstrap Grid System so that it will fit on every device. Besides, They created it with the latest web technology such as HTML5, CSS3, jQuery, and Bootstrap. Florence holds W3C valid markups. The developer team comments every section so that you can customize it. You can modify Florence within a time too. After all, if you are looking for an event template, then, it’s ideal for you. Using this template, you can achieve to store your memories! 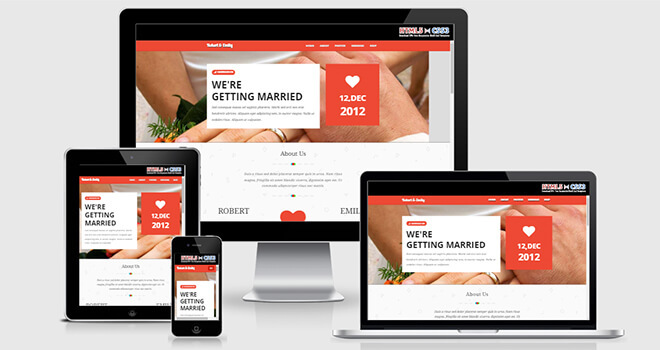 Wedding is a free responsive wedding websites template. It has a modern and elegant design that you’ll love. The developer team created its layout using Bootstrap frontend framework to make it easy to browse from each device. Also, they crafted it with the latest web technology such as HTML5, CSS3, jQuery, and Sass. Besides, The Wedding has W3C valid markups. The developer team comments every section so that you can customize it. You can modify The Wedding without wasting too much time. It is a 100% SEO friendly template. Are you searching for a great wedding event template for your upcoming wedding ceremony? Then, it’s perfect for you. Using this one page wedding template, you can achieve to store your wedding memories! Technology Used: HTML5, jQuery, CSS3, Bootstrap, SASS, Modernizr. Evento – A free one page event template! Are you searching for a great event template for your upcoming big event? Then, it’s perfect for you. 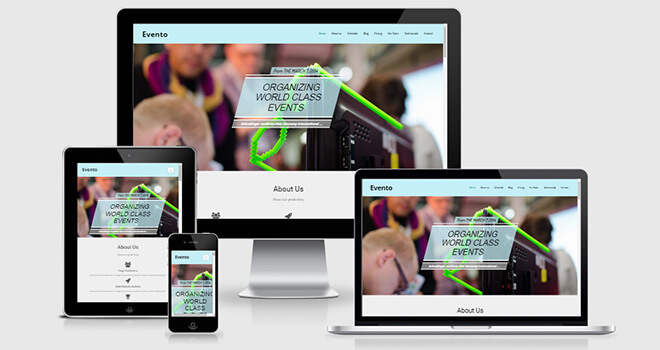 Evento is the completely responsive template. Because, the developer created it with Bootstrap, HTML5, and CSS3. Besides, Evento has error-free W3C valid well-commented markups. Meta titles and meta description present in the head section too. You can add meta information into the meta markups as your own. You can modify Evento without wasting too much time. Google will rank your website as they give focus on mobile friendly and SEO friendly website. Therefore, it is a 100% SEO friendly template. Afte all, Using this one-page event template you can achieve more success on your next big event! 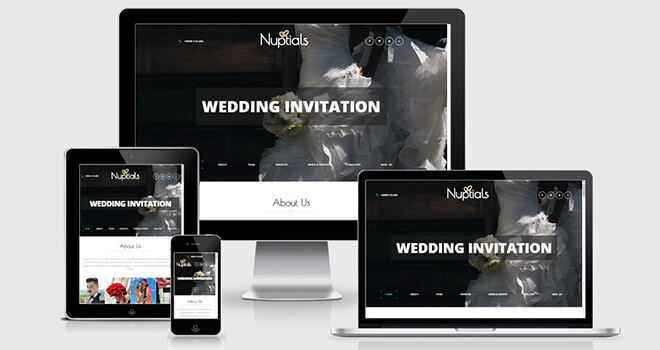 NUPTIALS is a Wedding Category Flat Free Responsive template. The developer team shaped it with a charm. Thanks to the captivating aura that sets the proper facet for the users. You can use this template to build a website for wedding planners, marriage brokers, marriage bureaus, and event makers. 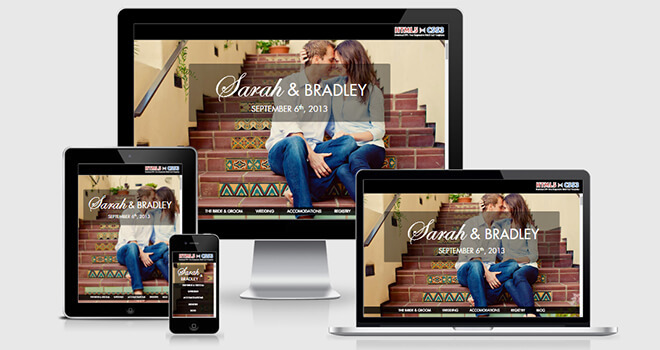 The enticing style of nuptials came out of HTML5, CSS3, and jQuery. The Colors, Icons, Animations, Slider, Countdown widget, and Alignment, make this a wonderful template that may charm the purchasers. The developer team commented each section thus that a user will customize it to his/her necessities. Also, the developer team uses Bootstrap Grid System so that it’ll match on each device. However, It has almost each section that you simply would like. Besides, Nuptials holds W3C valid markups. You can modify nuptials within a brief time. You’ve to embody metadata so that Google can rank your website. Therefore, it is a 100% SEO friendly template. After all, Are you looking for an event template? Then, it’s ideal for you. Using this template, you can achieve to store your memories! Technology Used: HTML5, jQuery Plugins, CSS3, Bootstrap. Your Wedding is a Neat Professional Event template. It’s mainly for wedding planners and event managers. Therefore, You can use this templet for any Wedding Planner websites. The developer built The Your Wedding template in an ornamental vogue. The appealing design of Your Wedding came out with CSS3 and jQuery. The Colors, Icons, And Animations make this an amazing template that may attract the guests. Also, Your Wedding has a contact form so that the guests may register to attend the ceremony. The developer team commented each section. So, The user of this template can customize it as per their needs as a result of its correct documentation. Also, the developer team uses Bootstrap Grid System as that it’s responsive. Besides, this template supports W3C valid markups. It is a 100% SEO friendly template. After all, it’s an ideal template for you, and it’s almost each section that you just would like. 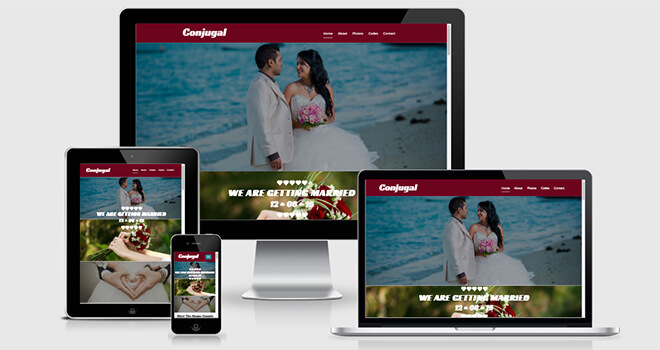 Conjugal is specially a Wedding Category Free Responsive Template. The developer team crafted it with a charm. One can use this template to build a website for wedding planners, marriage brokers, marriage bureaus, and event makers. The entire alluring design of Conjugal came out of HTML5, CSS3, and jQuery. The Colors, Icons, Animations, Countdown widget and Alignment make this an excellent template that will charm the guests. The developer team uses Bootstrap Grid System so that it will suit on every device. Also, the developer team commented each section. Therefore, the user can customize Conjugal to his/her wants. Besides, Conjugal holds error-free W3C valid markups. It is a 100% SEO friendly template. After all, it’s an ideal template for an event handler. And, It has almost every section that you need. Edusite is a complete free HTML education template to make website for schools, colleges, and similar institutions. As a multi-page template, it has four pages to add the details and organize the full website with relevant information. If you simply look at the UI, the parallax effect and on-hover animation add more beauty to it. It’s a device responsive template, as well. Which means your site will work fine on all the devices. Studies Plus is a free HTML5 template for academic purpose. The design of Studies Plus showing a beauty with an adorable glows. CSS3, jQuery, and Bootstrap provide an excellent design and layout to this template. Besides, The W3Layouts team adds comments before every section. Therefore, you can simply notice wherever to create changes. Also, it is SEO friendly. The developer team includes SEO tags like meta keywords, meta name, meta description, etc. You have to add your meta information into these so that Google can rank your page. 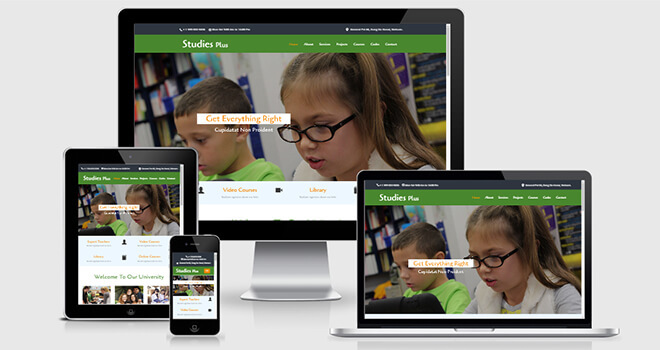 The Studies Plus is an appropriate template for people who are searching for an educational website. Why will you choose Studies Plus? Because, First of all, this is 100% free. Secondly, it has about all the sections that an educational website wants. Third, it is 100% responsive template. 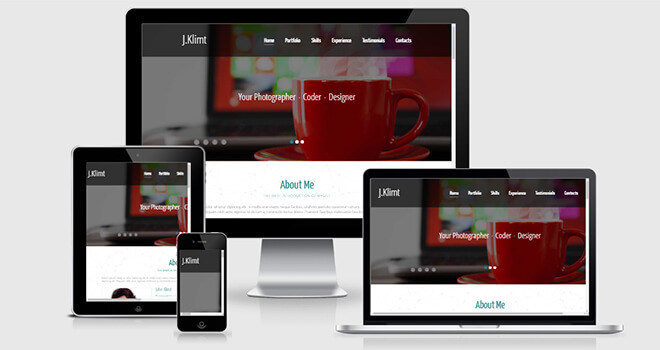 Lastly, it is a html5 template that contains latest technologies. Therefore, The Colors, Fonts, and Animations match up to make Teaching template standout. After all, This sure is the best choice for your educational website and to look pleasing for your target users. Also, The whole ambiance to this design grips attention and charms the users. Before downloading, please go through the website template and verify if they match your requirements. 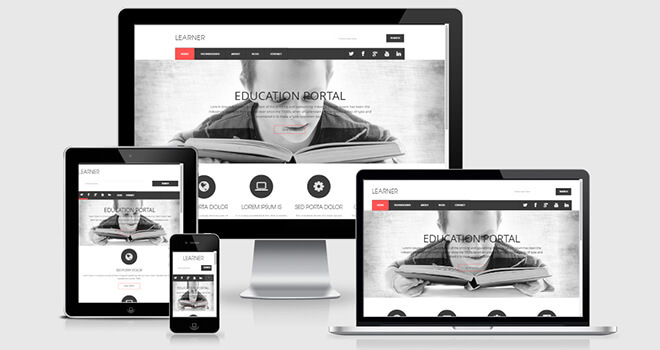 Learner is a Free Responsive HTML5 Bootstrap Template for academic purpose. The design of Learner showing beauty with an endearing shines. CSS3, jQuery, and Bootstrap give a great formation to the present template. 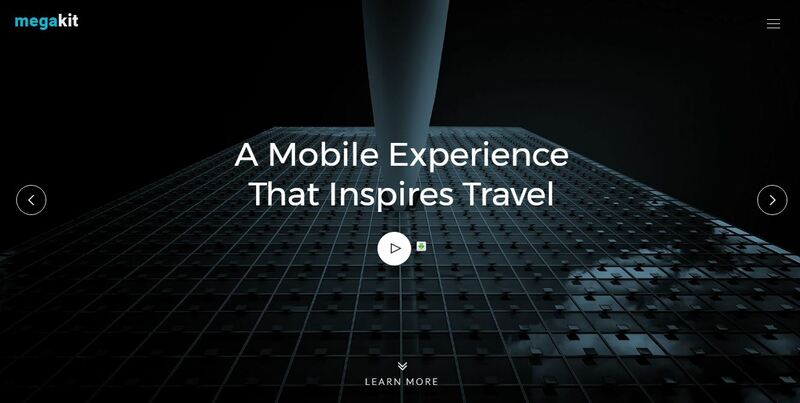 The use of typography and animations could be a visual treat. In a word, these are the necessary property for an educational website. Also, The whole ambiance to this template grips notices and charms the users. In a nutshell, The Colors, Fonts, and Animations match up to make Learner template standout. The Learner is a suitable template for those who are craving for an academic website. First of all, this is 100% free. Secondly, it has about all the section that an educational website desires. 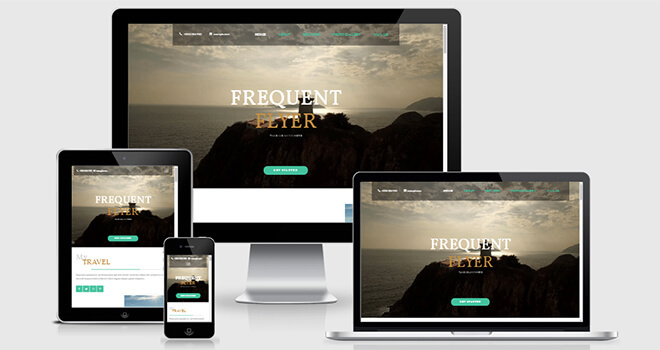 Thirdly, it is 100% responsive template for all devices. Lastly, it is an HTML5 template that contains latest technologies. After all, This sure is the best option for your educational website and to appear pleasing for your target users. Technology Used: HTML5, jQuery, CSS3, Bootstrap, Google Fonts, Font Awesome, Owl Carousel, Flex Slider. Techno is a free one page responsive template for academic purpose. The design of Techno showing beauty with an adorable shines. CSS3, jQuery, FontAwesome and Bootstrap give a unique outlook to this template. The use of typography and animations is a visual treat. In a word, these are the necessary property for an academic Website. Also, The whole ambiance to this template grips notices and charms the users. Therefore, The Colors, Fonts, and Animations match up to make Learner template standout. Besides, The W3Layouts team adds comments before every section. Therefore, you can change where you want. Also, it is 100% SEO friendly. The developer team includes SEO tags. You have to add your meta information into these so that Google will rank your site. The Techno is a suitable template for those who are looking for an educational website. First of all, this is 100% free. Secondly, it has about all the section that an educational website needs. Third, it is 100% responsive template. Lastly, it is a html5 template which contains latest technologies. Before downloading, please go through the website template and verify if they match your requirements. After all, This sure is the best choice for your educational site and to look pleasing for your target users. 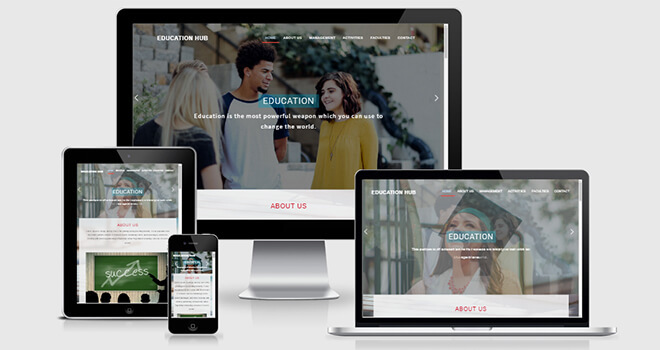 Genius Educational Institution HTML5 Bootstrap template is a modern and clean multipurpose. The webthemez team built this template with W3C valid HTML5 & CSS3. Also, they use Bootstrap so that it is fully responsive with multi-browser and devices. The user can use it for multi-purpose needs like Educational Institutes, e-Learning, Training Center, Tutors, Charity, agency, and portfolio website. The design of Genius showing beauty with an adorable shines. CSS3, jQuery, and Font Awesome give a simple but excellent outlook to this template. The use of typography is a visual treat. In a word, these are the necessary property for an academic Website. Also, The whole ambiance to this template grips notices and charms the users. Therefore, The Colors, Fonts, and outlooks match up to make Educare template standout. 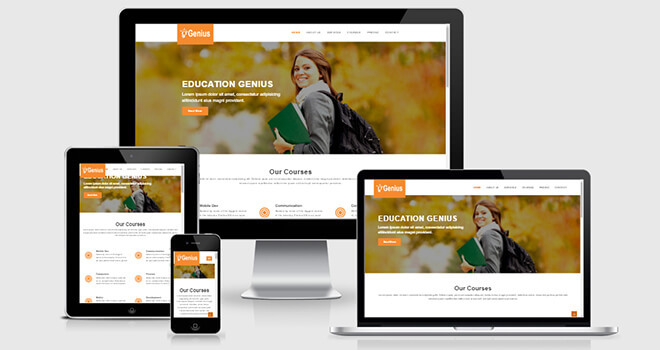 The Genius is a suitable template for those who are looking for an educational website. First of all, this is 100% free. Secondly, it has about all the section that an educational website needs. Third, it is 100% responsive template. 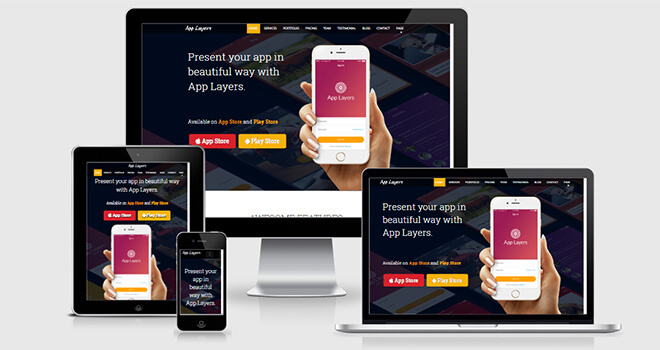 Lastly, it is a html5 template which contains latest technologies. Before downloading, please go through the template to match your requirements. After all, This sure is the best choice for your educational website. Education hub is a free one page responsive template for academic purpose. CSS3, jQuery, FontAwesome and Bootstrap give a unique outlook to this template. It has the necessary properties just like as an educational Website. Also, it is 100% SEO friendly template. 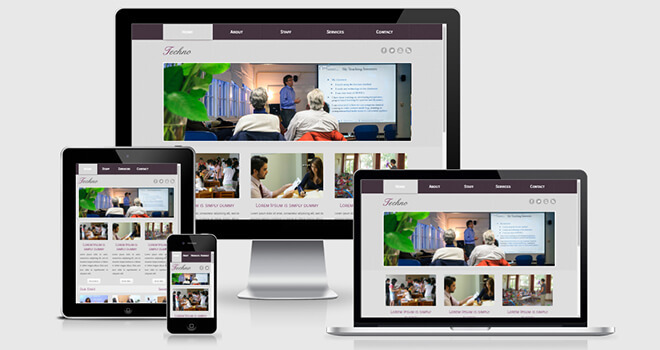 The Education Hub is a suitable template for those who are looking for an educational website. Before downloading, please go through the website template and verify if they match your requirements. After all, This sure is the best choice for your educational site and to look pleasing for your target users. 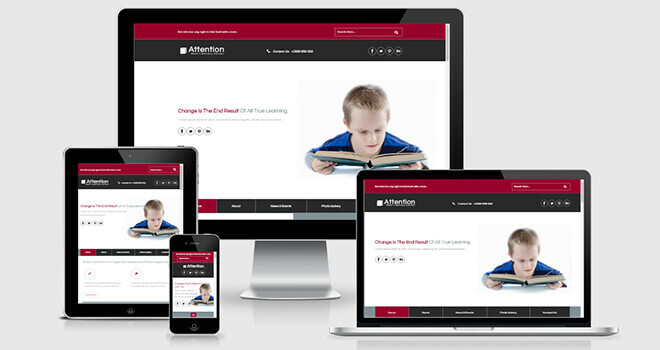 Attention is a clean, flat and Educative Multipurpose Template for Schools, Institutions, Universities, and Colleges. The user can customize it easily as their wishes. It appears with a free Flat Responsive template. The developer uses Bootstrap grid system for the mobile-first concept. So, it fits on every handheld device. It is compatible in the popular Browsers. It has business services like About, Academics, Services and a complete Contact form This web template contains a Fancy style. You can use this template for your upcoming website. Technology Used: HTML5, jQuery Plugins, CSS3, Bootstrap3, Google Fonts, Font Awesome. Smart Kids is a modern academic template. It is a clean and flat template too. The WebThemez team built it in a beautiful way. Smart Kids has unique layout concept. It has the elegant design, superior style, and clean UI too. They built Smart Kids with W3C valid HTML5, CSS3, and the latest Bootstrap frontend framework. Besides, The developer team adds comments before every section so that you can see where to make changes. It is a super easy template to customize. Also, it is SEO friendly. After all, WebThemez team develops it just for all kinds of the academic purpose. Before downloading, please go through the website template and verify if they match your requirements. Technology Used: HTML5, jQuery Plugins, CSS3, Bootstrap, Google Fonts, Font Awesome, Animate.css. Eduma is a modern, clean and flat multi-purpose academic template. It contains all necessary sections so that a user can fulfill their needs by this template. Besides this, The W3layouts team built it in a way that anyone can use it for any purposes. It has the elegant design, superior style, and clean UI with the video background, smooth CSS3 animations and nice jquery effects. 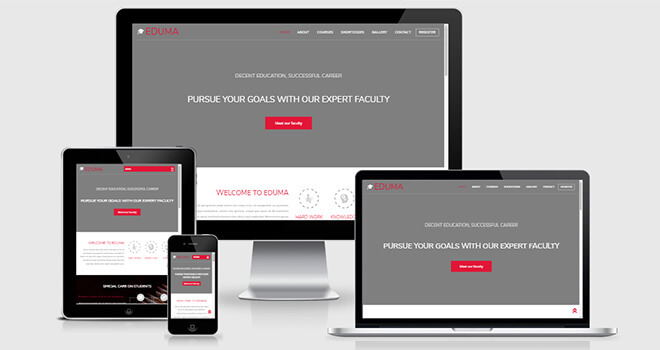 They created Eduma with W3C valid HTML5, CSS3, and the latest Bootstrap frontend framework. For the use of Bootstrap, it is 100% responsive. After all, The W3layouts team develops it mainly for the academic purpose. Before downloading, please go through the website template and verify if they match your necessities. 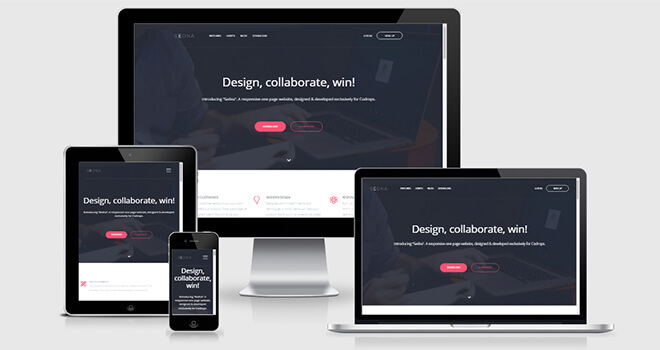 The Victory is a modern and clean multipurpose educational HTML5 Bootstrap template. The webthemez team built this template using W3C valid HTML5 & CSS3. Also, they use Bootstrap grid system so that it is fully responsive with multi-browser and devices. The design of Victory showing its beauty with the power of CSS3 animations, jQuery plugins, Font Awesome and bootstrap classes. Typography, color combination, section placement is a visual treat. In a word, The whole atmosphere of this template grips notices and charms of the users. After all, This sure is the best choice for your educational website. The user can use it for multi-purpose educational institutes like e-Learning, Training Center, Tutors, Charity, agency, and portfolio website. Before downloading, please check the entire template from demo link to match your requirements. Technology Used: HTML5, jQuery, CSS3, Bootstrap3, Google Fonts, Font Awesome, Modernizr, Isotop Packege. 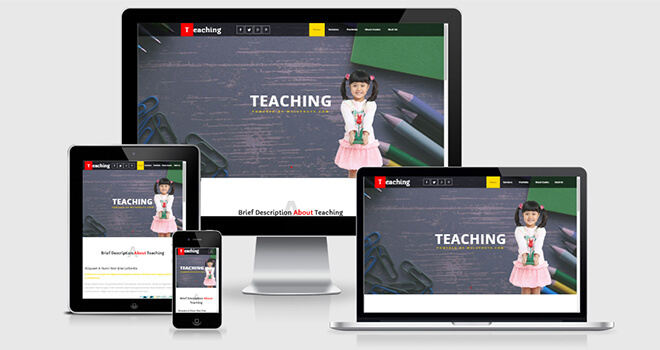 Teaching is a Free Responsive HTML5 Bootstrap Template for academic purpose. Before downloading, please surf the whole template and verify if they match your needs. After all, Teaching is a suitable template for those who are looking for an educational website. This assures the best choice for your educational site. Technology Used: HTML5, jQuery Plugins, CSS3, Bootstrap, Google Fonts. Wow.. !! 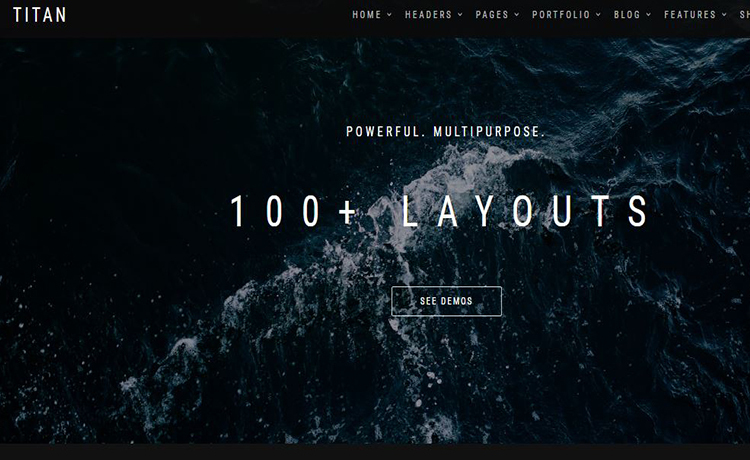 Absolutely brilliant list of free high-quality multipage one-page multipurpose templates. Each and every template is very easy to customize and I like to use it. Is there a way to download all at once with one link? Thanks for finally writing about >150+ Best Free Responsive HTML5 Bootstrap Template of Different Categories in 2018 <Liked it!